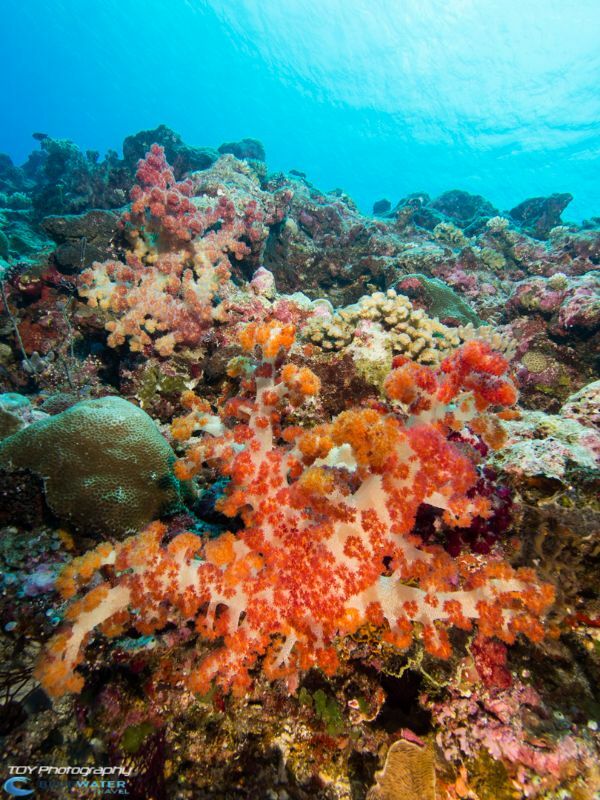 Palau's walls are covered in healthy colorful soft corals. After a long flight from Los Angeles, a 7-hour layover in Taiwan, and another short flight, we touched down in Koror at about 6:30 pm. Flying in, we glimpsed verdant curling island structures under dim twilight. The Koror airport felt rustic and quaint compared to most modern international airports. By the time we left it, night had fallen and so we wouldn’t view the full natural beauty of Palau until the next day. 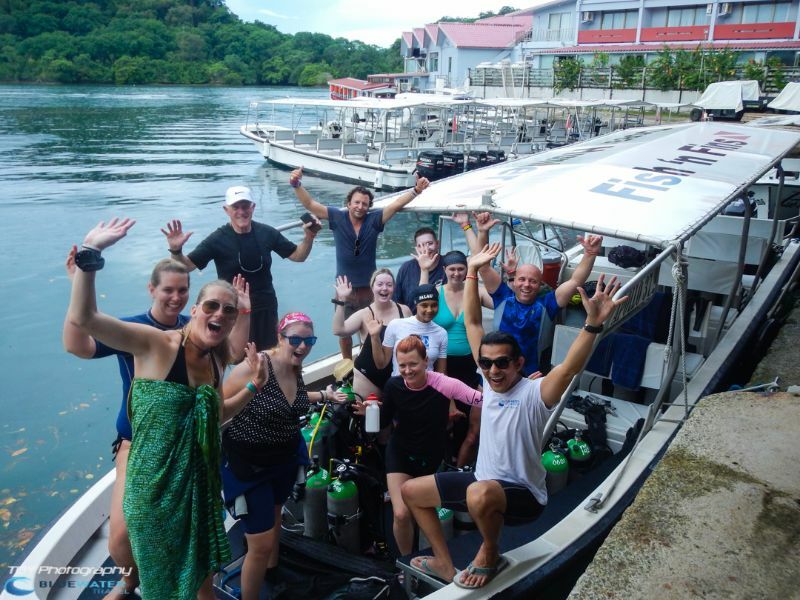 A few representatives from our dive shop, Fish ‘n Fins met us at the airport and drove us across the bridge from Koror Island to Palau Island to our hotel: Palau Royal Resort. The resort was an open garden beach type affair, complete with lounging couches, small stone cupolas, a dive shop of its own, a pool, a Jacuzzi, a personal beach, a massage spa, a restaurant, a few bars, and a pond with a sea turtle. As divers, we were obsessed with the turtle. The turtle was stared at, fed, and discussed at length. Some were particularly concerned with the sea turtle’s freedom, and there was talk of a “free the turtle” heist, which never came to pass. After checking-in we settled in for a night’s sleep before our first day of diving the next day. 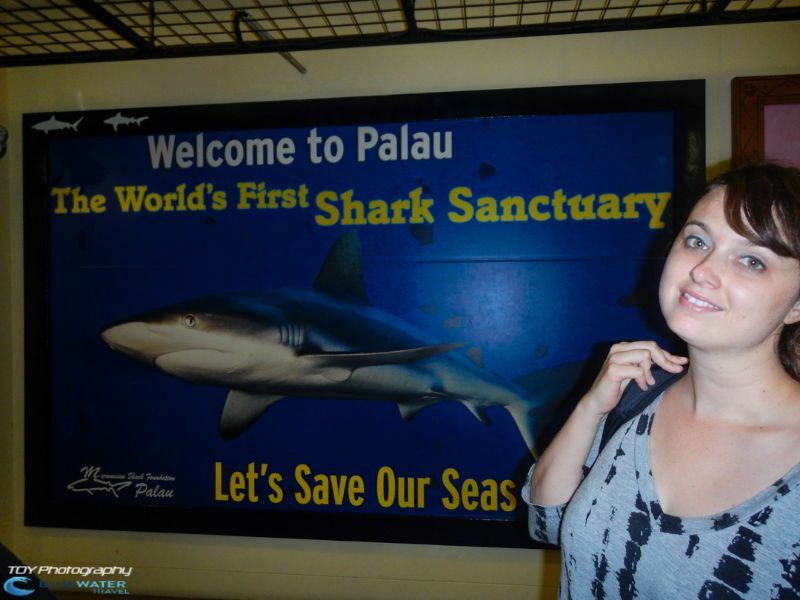 Left: Greeted by a shark at the Palau airport arrivals hall. Right: All ready to go out for our first dive. Breakfast was included, so we hit the weirdly wonderful breakfast buffet early in the morning at 6:30 am. The menu included: eggs made any way you could want (omelet, sunny side up, over easy, scrambled), assorted pastries (meat-filled buns, chocolate croissants, etc. ), waffles, pancakes, porridge, Chinese soup & miso soup, hash browns, corn fritters, bacon, sausage, pork rice, potato gratins, coffee, various juices (pineapple, apple, orange, etc. ), cereal, and more. The Fish ‘n Fins shuttles picked us up from Palau Royal Resort, took us back to the dive shop to register and get set-up. We left the dock at about 9 am and sped through flat, stunning turquoise aquamarine waters surrounding islands covered in verdant rainforest foliage. 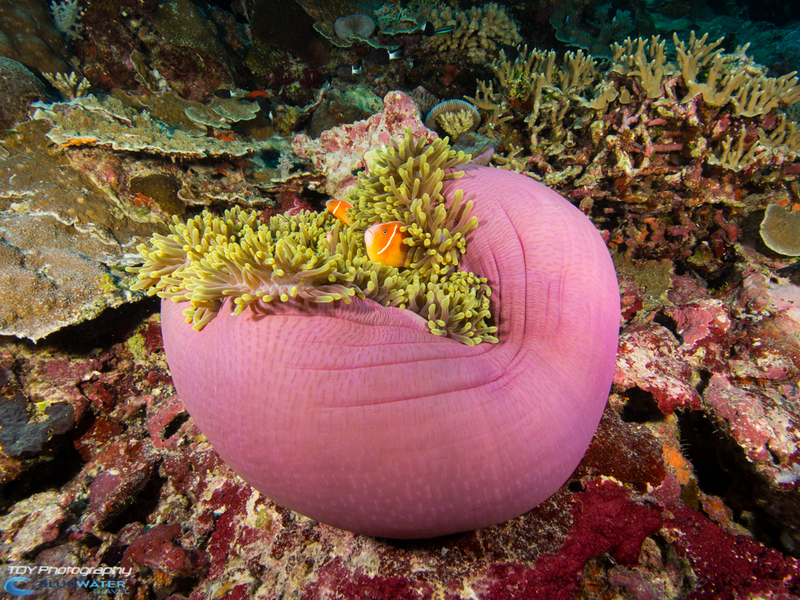 Gorgeous soft and hard corals even on our checkout dive at German Wall. 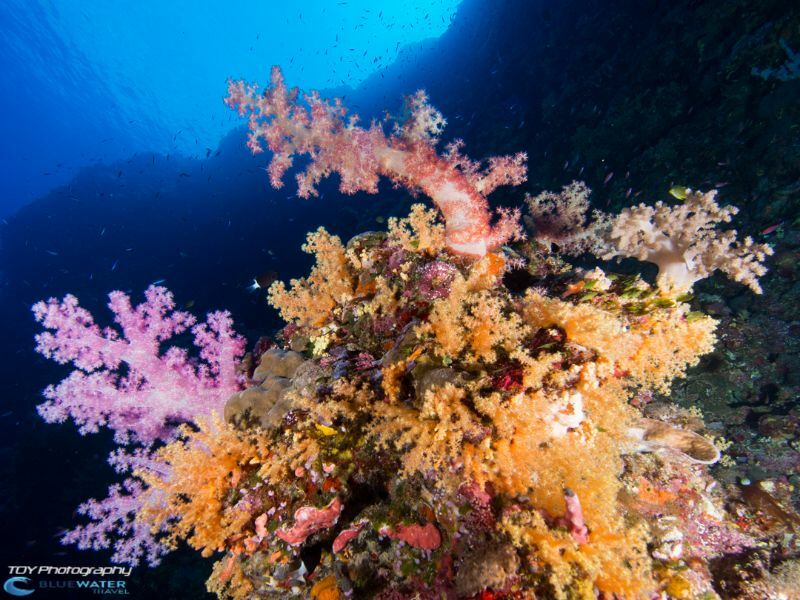 The first dive of the day was a check out dive at German Wall, a steep vertical wall running along the length of Ngemelis Island. 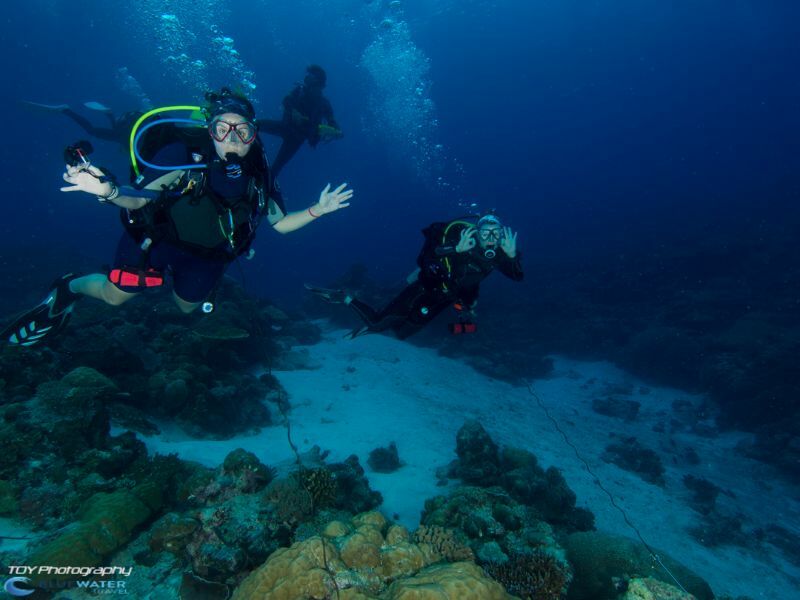 This was an easy, slightly less exciting dive–but a calm, convenient first checkout dive that afforded us vistas of hard coral, a few blacktip reef sharks, a whitetip reef shark, a couple of turtles, anemone fish, and a stingray. A little before noon, we took lunch on a beautiful white-sand beach lined with lush jungle. 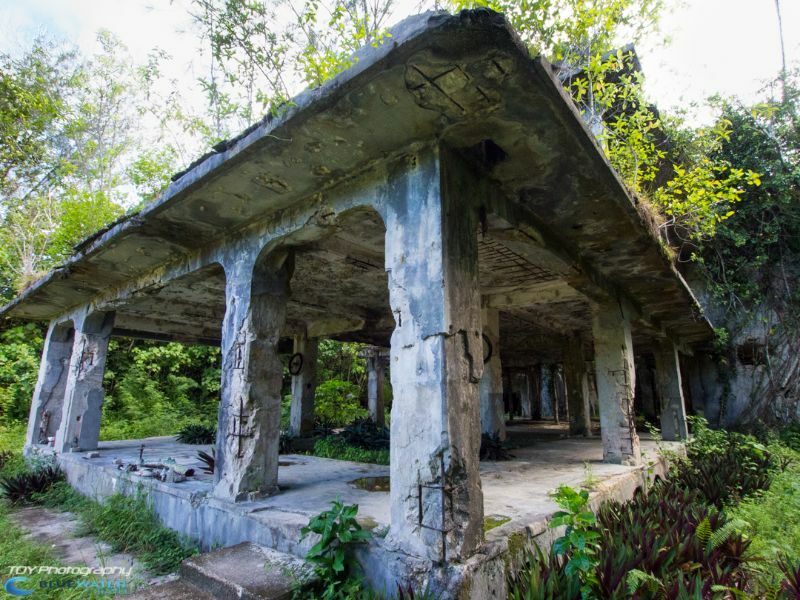 Most of the group sat at picnic tables painted in bright colors faded by the harsh Palauan climate. We ate pre-prepared lunches that came in 20 varieties courtesy of Fish ‘n Fins. We could choose anything from grilled, BBQ, or fried meat, fish, or tofu, a variety of Italian pastas, and sandwich options. Each day the crew asked us to select what we would like to eat the next day from these 20 options. Each day a bento box lunch was ready and waiting for us between dives. The second dive of the day was at German Channel. Germany occupied the Palau islands from 1899–1914, at which point they passed control of the islands to Japan. During this period, the Germans excavated German Channel by blasting and dredging their way through the barrier reef. 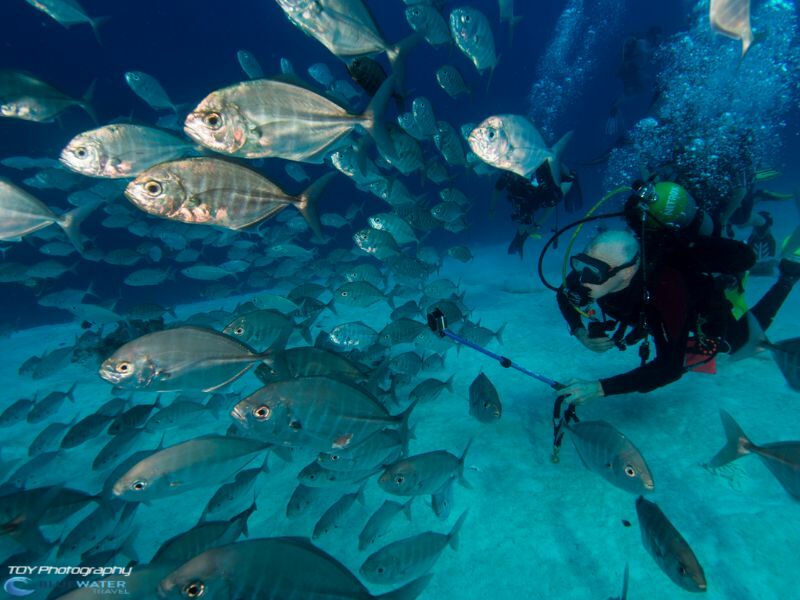 Diving in the channel itself is not possible due to the presence of fast-moving speedboats and shallow water. And so, the southwest mouth of the channel is known as the German Channel Dive Site. While diving this piece of history, we viewed more sharks, turtles, hard coral, and an impressive school of red crescent-tail bigeye fish with large, googly eyes. 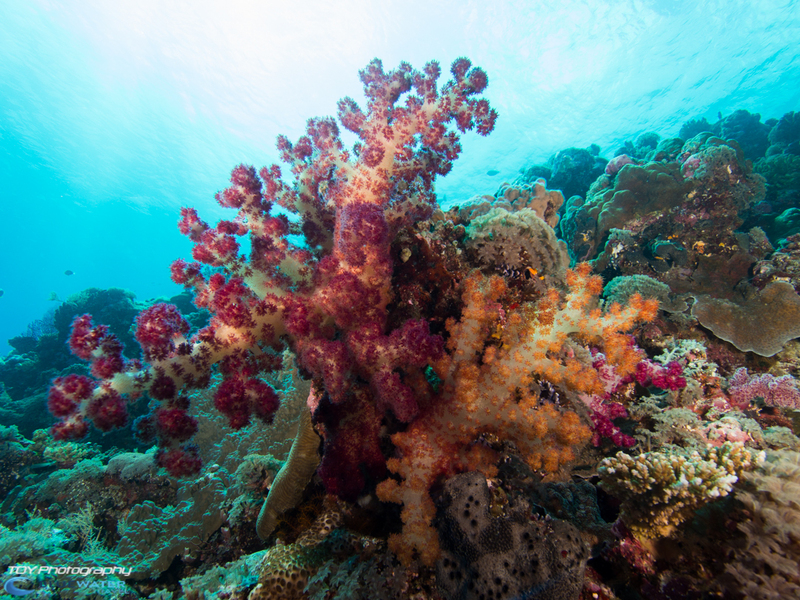 The beautiful soft corals extend to the German Channel. 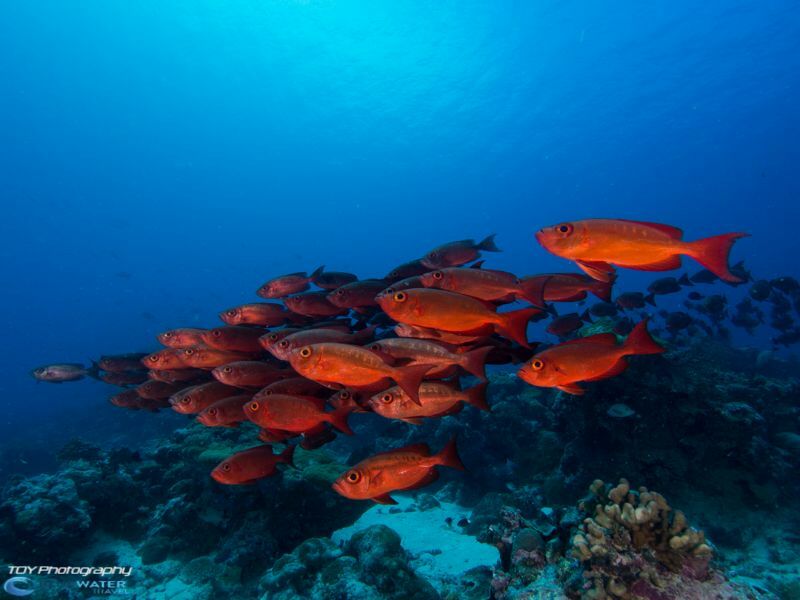 A school of soldierfish hovers in the mild current at German Channel. After the second dive, we went back to the shop where a few divers stayed back to do a third dive off Fish ‘n Fins’ dock (aka the house reef). The dive was out in the harbor and promised an opportunity to see Mandarinfish. 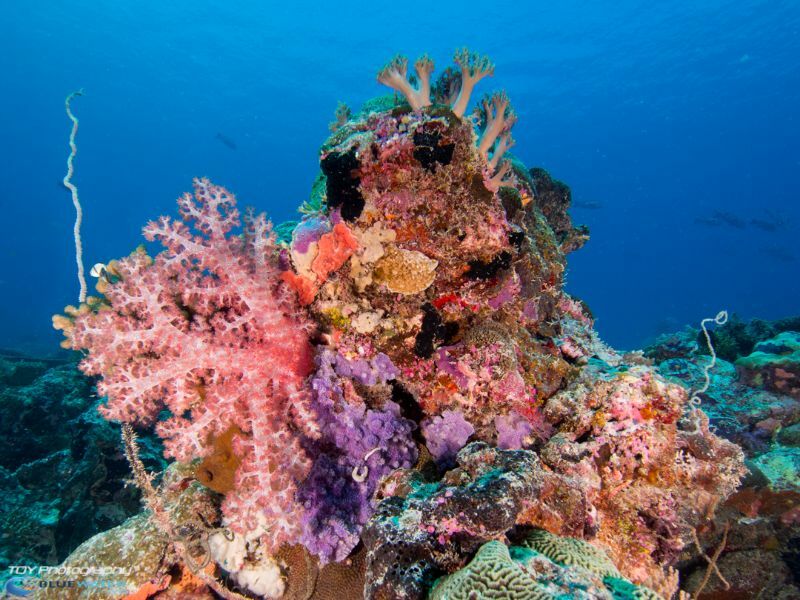 It is a good muck diving site that differs from the typical Palauan dives in current. 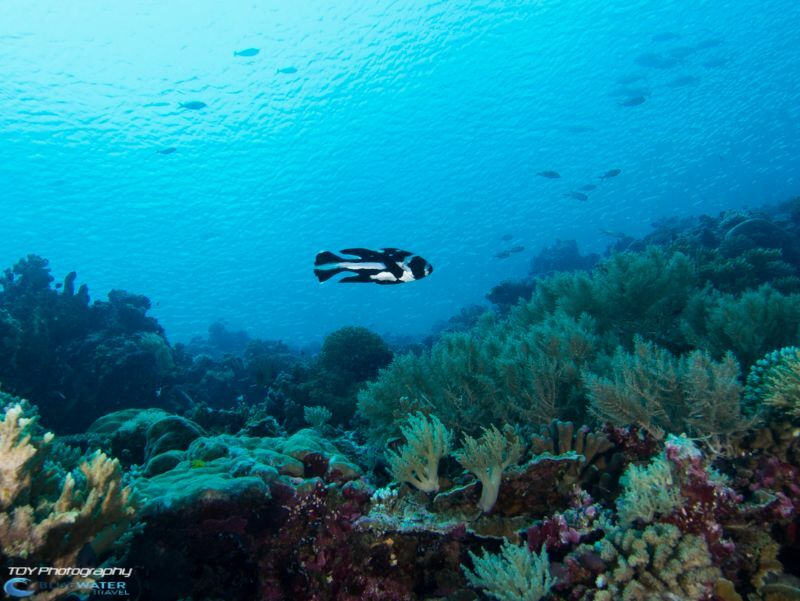 Although no Mandarinfish were seen, we did see many cardinalfish and shrimpfish. Dinner was at Carp restaurant, reportedly the first restaurant on Palau. We chose this place to eat based on a few recommendations and its close proximity to our resort. The waitress did not warn us about the portion sizes, which were gigantic. We each ordered a dish, thinking it would be entrée size. Instead, each dish turned out to be nearly large enough to feed the entire table. 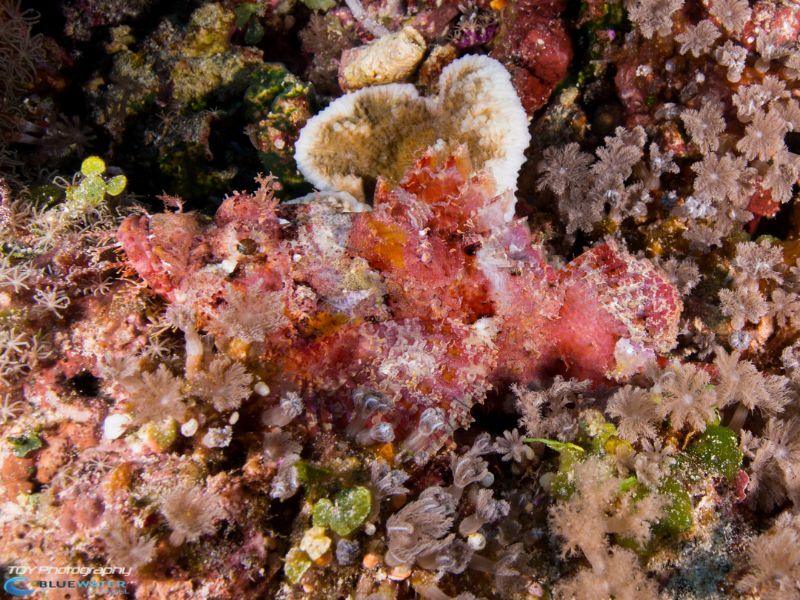 Left: Leaf Scorpionfish at Ulong Sandbar. 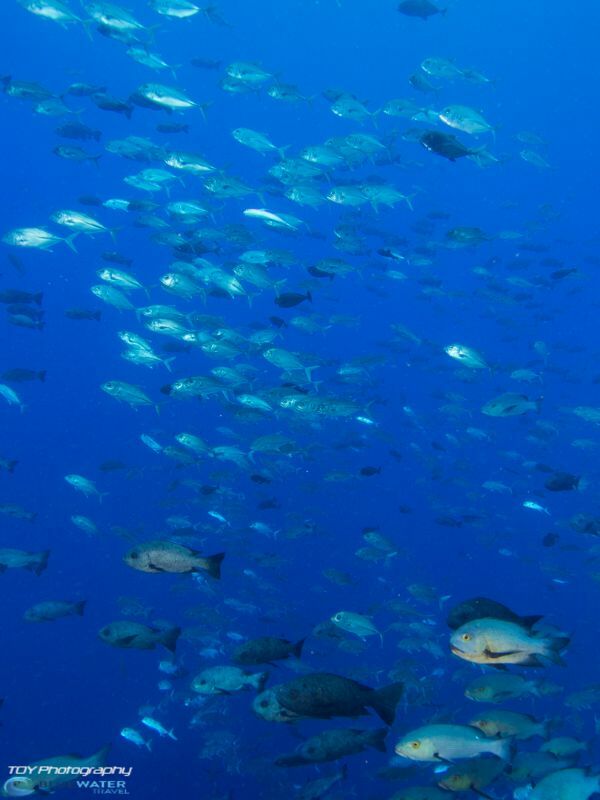 Right: Swimming through large schools of trevally. We took an early breakfast buffet then met our Fish ‘n Fins dive boat at the resort’s dock. 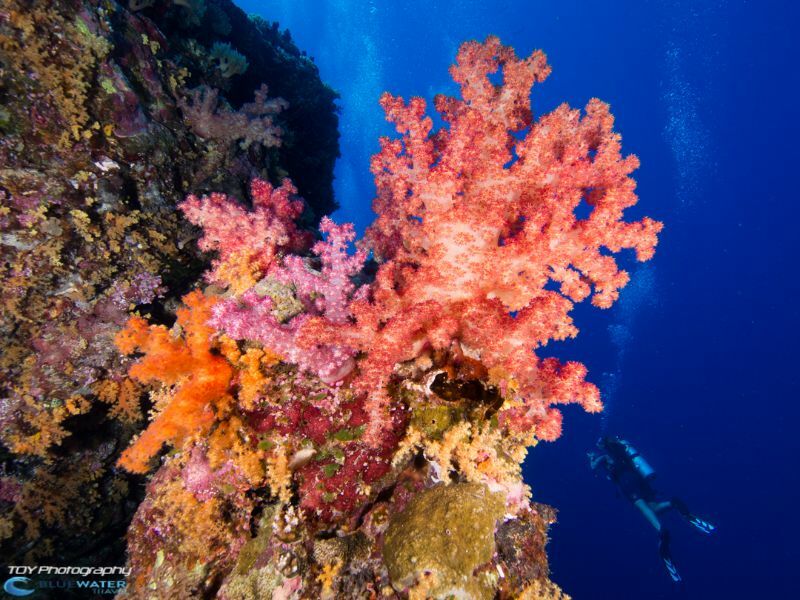 Our first dive of the day (fourth dive of the trip) was at a distinctive sand bar West of Ulong Island. We saw: Leaf scorpionfish, a school of barracuda, and silver trevally. 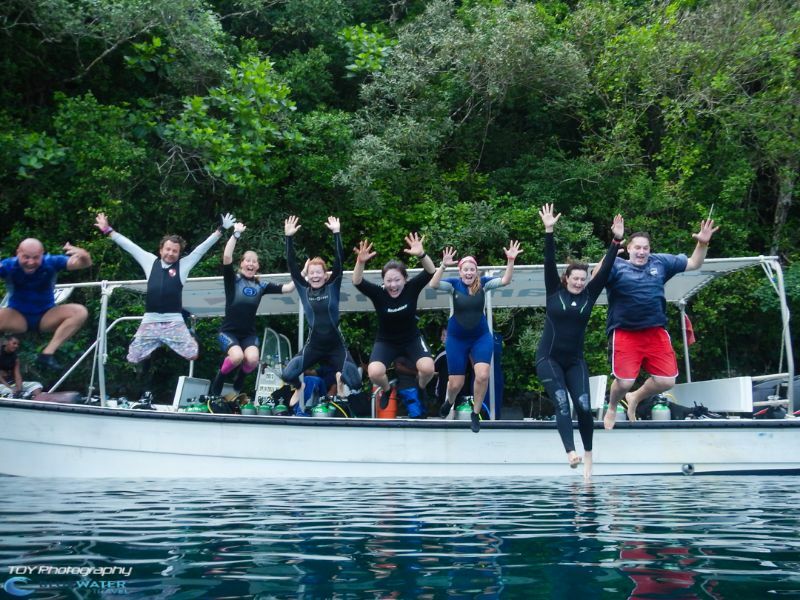 Our dive at Ulong Chnnel was one of the most spectacular dives of the trip, and our first opportunity for reef hooking! 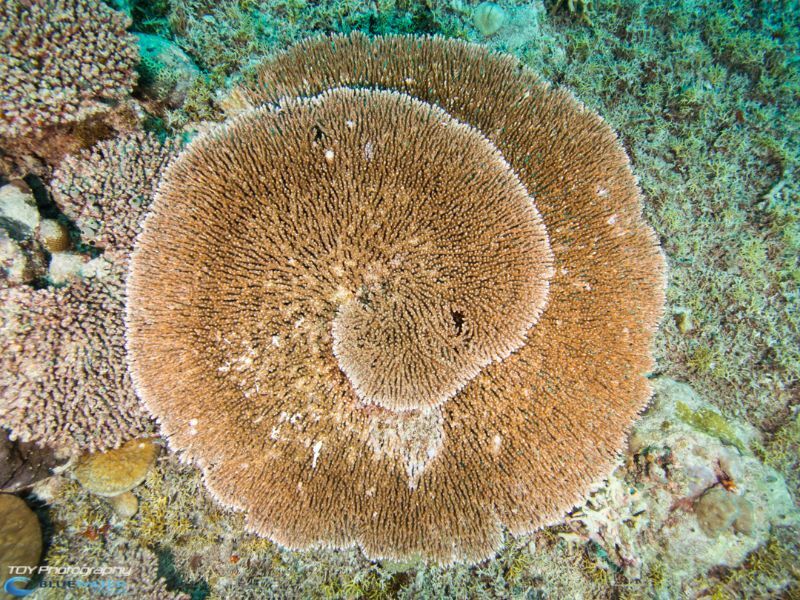 Currents in Palau can get strong. 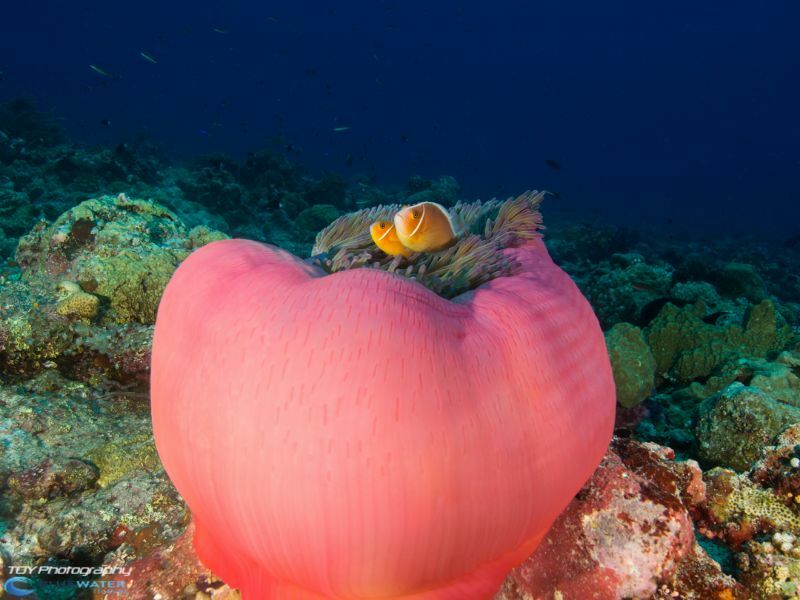 So strong, in fact, that a great way to see the reefs involves simply hooking on and chilling out while the fish go by. No swimming necessary, which is a great way to conserve energy and air while enjoying the open ocean aquarium. Best of all, where there’s current, there’s life. Hooking in and watching the sharks swim by. 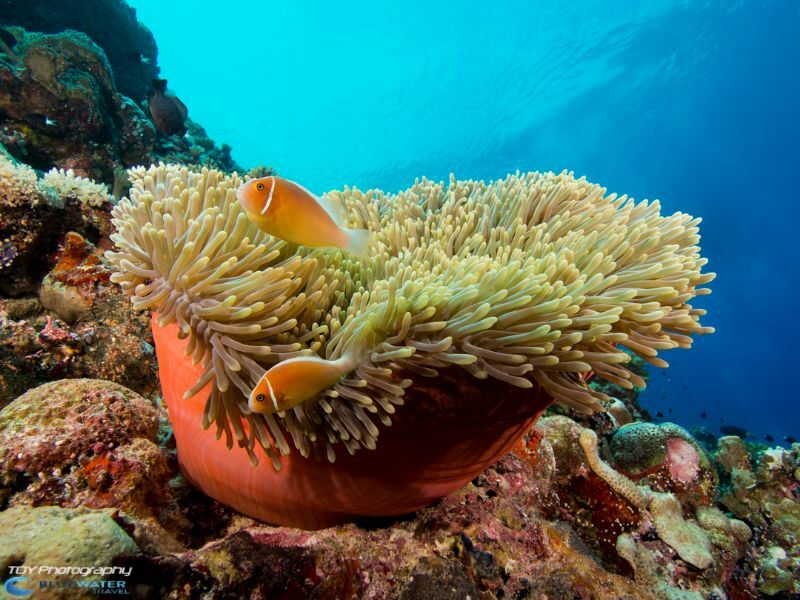 Hooking in raises the diver away from the reef and prevents damaging the fragile corals. And voila! You are reef hooking. If the current is strong enough, you may feel like you’re Supermanning it underwater—in which case, lucky you. • Don’t hook behind another person, or you’ll be staring at their backside instead of the pristine marine panorama you came to see. 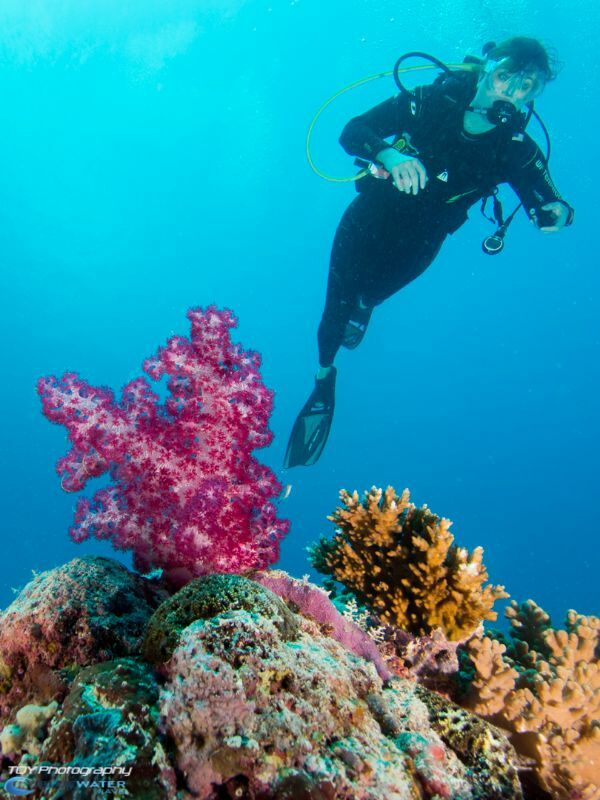 • If you become UNhooked, quickly deflate your BCD and swim close to the reef until you find another hooking spot so the current doesn’t push you out to Timbuktu. After unhooking we drifted down the channel and enjoyed the reef on either side. 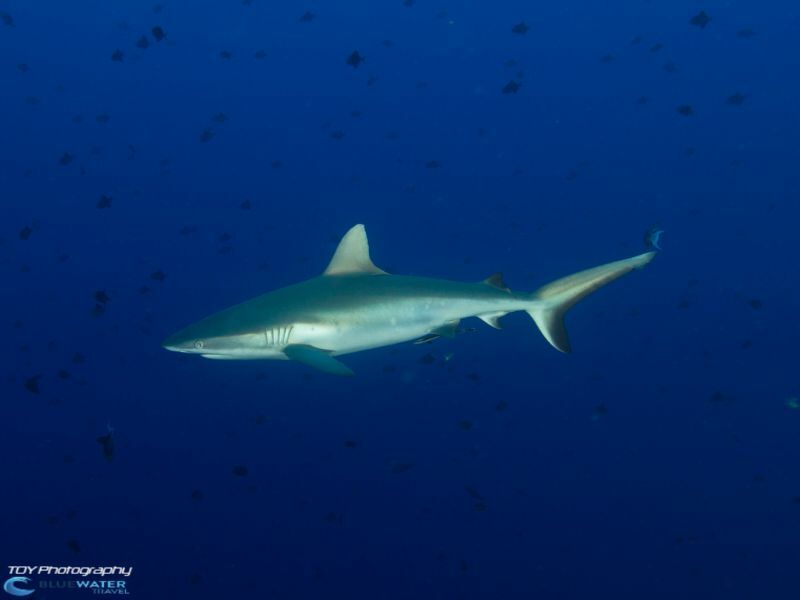 Back to the spectacular Ulong Channel dive: while we were under the sea in this patch of Palauan ocean we saw a big school of jacks and a plethora of black-tip reef sharks—the most we saw the entire trip (while hooking). 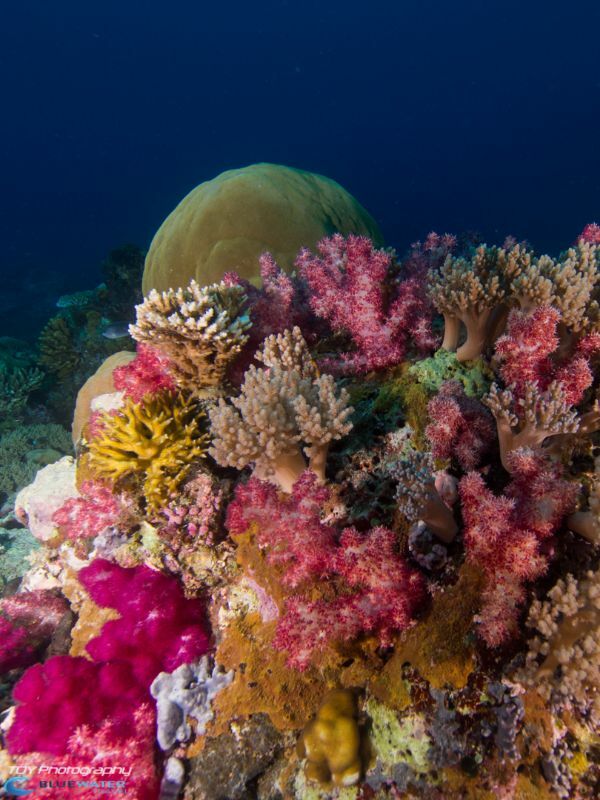 After we unhooked from the reef and we were drifting down the channel, we saw many nice, colorful soft corals and a vast patch of green cabbage coral. A group of us later walked over to The Drop Off for dinner, a local bar owned by someone originally from Pasadena. All of the drinks and food on the menu were pretty tasty: strong mai tais, local beer, ramen, fishsticks, cheese pizza, and more. Even at the bar, there were opportunities to sight sea life. Looking over the bar patio railing, we glimpsed squid illuminated by streetlight. Left: The wrecks towers rise 60 feet above the deck. Right: Diver swims under the towers which are encrusted with life. Left: Diver swims through the hole in the hull that was torpedoed. Right: Jellyfish on the Iro wreck. 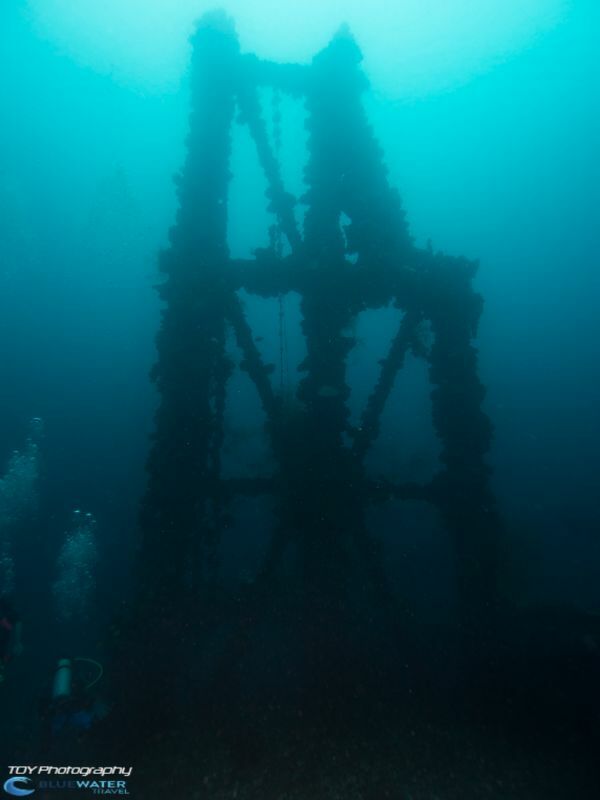 The first dive of the day was our first wreck dive in Palau–a Japanese fleet oiler and supplier ship, which was built in 1922. 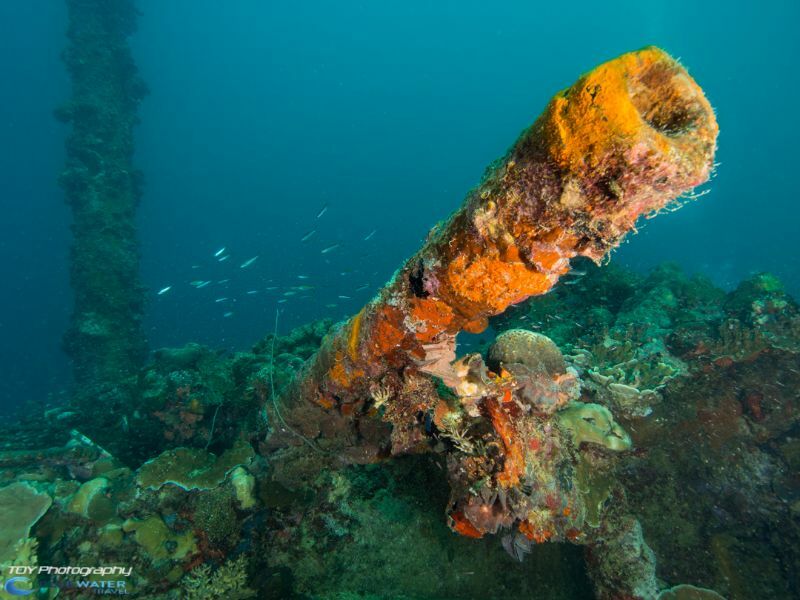 On March 22, 1944, the Iro was transiting from the Philippines when a torpedo launched by a U.S. submarine struck the ship. The bow section was damaged and the Iro entered Palau for repairs. But on March 30, 1944, the ship was attacked again. This time by air in operation Desecrate One, which resulted in a massive explosion in the engine room that sent the ship hurtling down toward its present depth. Today, the Iro is resting upright in 120 feet of water, with the deck at 85 feet and the top of the tower at 25 feet. After descending down a line, we swam through the torpedo hole! It’s remarkable to think that the ship continued to function after suffering this massive blow. Highlights of the dive included: going down into the engine room and the great gun on the ship that rotated on a vast wheel. 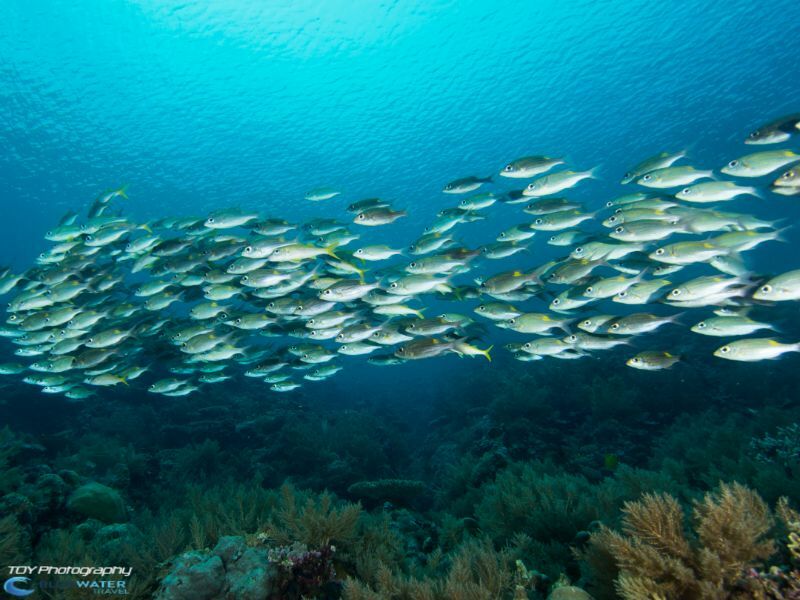 Blue Corner is an extremely popular dive in Palau, and in our experience it was the second best dive site (next to Ulong Channel) for fish and sea life spottings. Blue Corner is renowned for its strong currents, which can change without a moment’s notice. The current certainly felt strong to those of us who were Supermanning it on our reef hooks. The current swooshed by as if it were strong gusts of air and we were Superman flying. 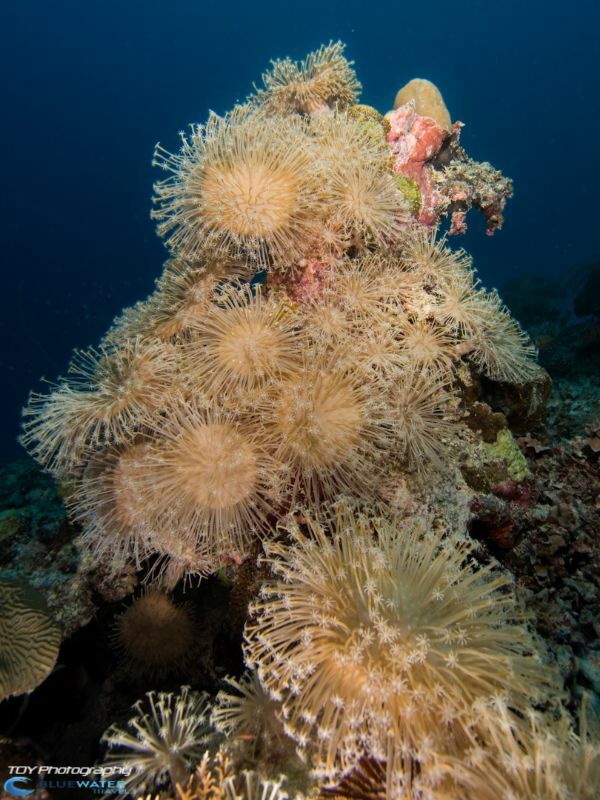 Only we were underwater overlooking a corner ledge and a sea of aquatic life as it passed us by. During this dive we saw: a school of red crescent-tail bigeye fish, many more black-tip reef sharks, a spotted eagle ray, and huge Napoleon wrasse. Left: Hooking into Blue Corner and watching the schools of fish. 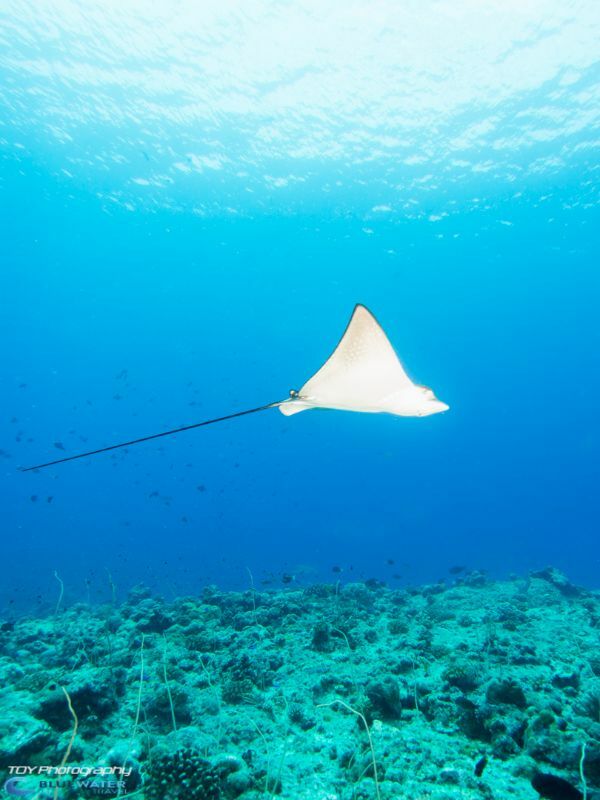 Right: An eagle ray easily glides through the water against the current. Left: Napoleon wrasse stuck with us the entire dive. Right: Blue corner had a lot of life even after unhooking. After a lunch break on another gorgeous island, the boat motored us to a small harbor where other boats were moored. 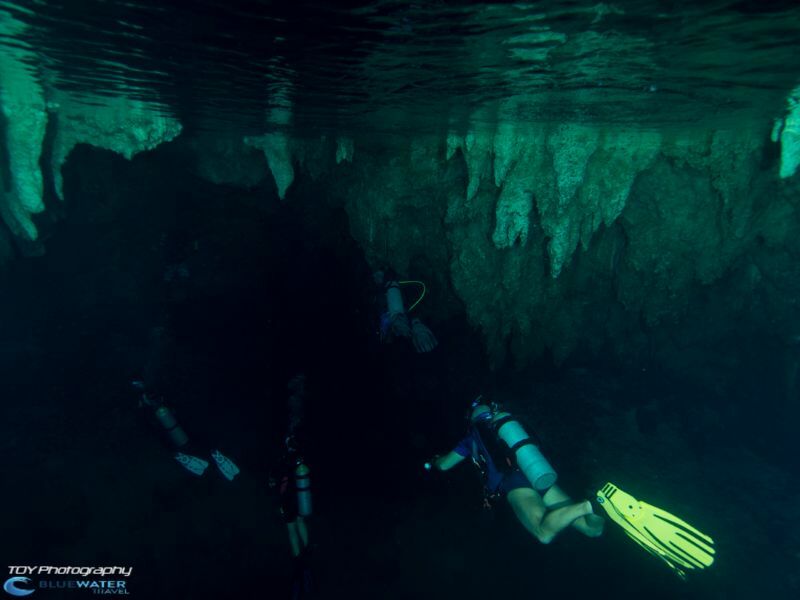 The entrance to Chandelier Cave is through an opening underwater in the cliff face, and inside the opening: blue, silty water that gave way to utter darkness. We were warned there was sediment at the bottom of the cave that could easily be kicked up to interfere with visibility, and the top of the cave was studded in stalacites. 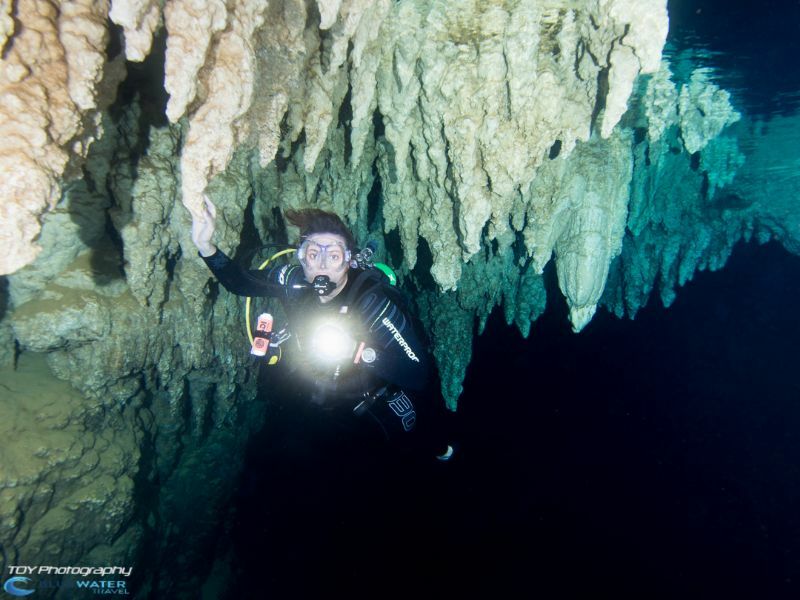 Interestingly, there are four air pockets in the cave, where divers can surface, take out their regulators, and breathe while viewing stalacites and staligmites. 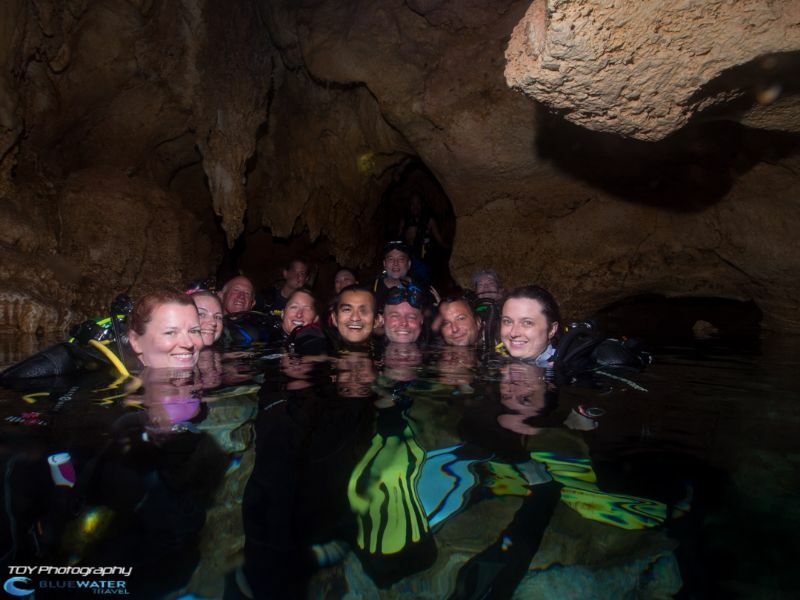 On the way back out, we all turned off our dive lights and swam out toward the ambient light. 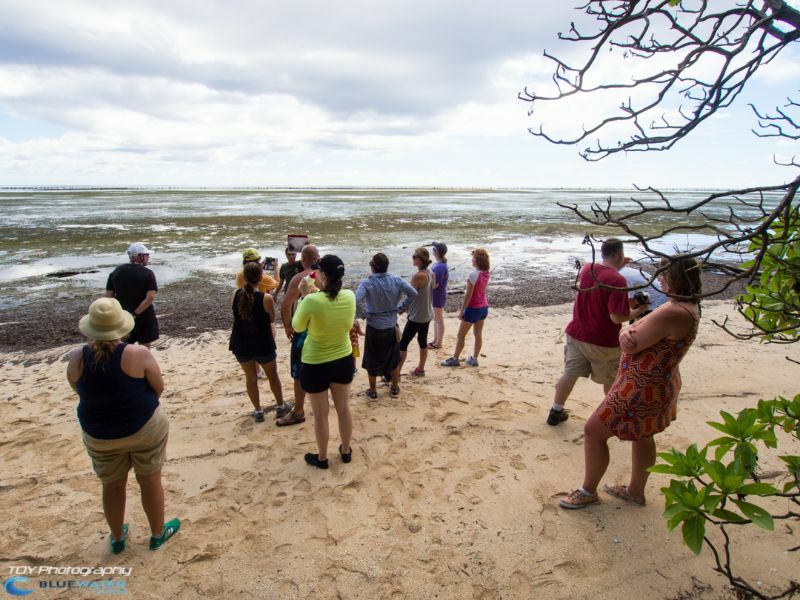 When we surfaced, we learned there was a chance of mandarinfish in the harbor, so back down under the boat we went to search through the silty water for a small, tiny, colorful fish that some of us never saw—although others were more fortunate in the finding of this fish. 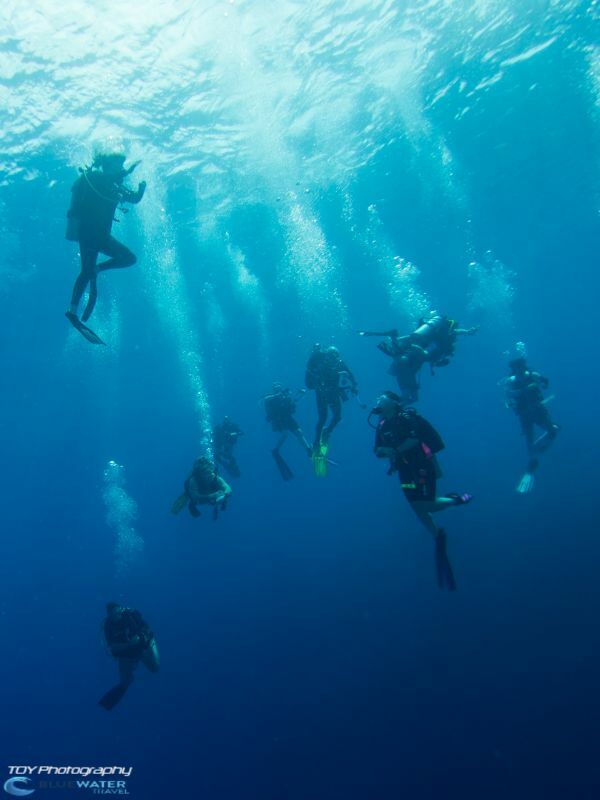 Many in our group agreed that this was the best day of diving for sheer variety: wreck, reef hooking, and cavern. After returning to the hotel for a shower, there was another group dinner at a restaurant downtown recommended by a taxi driver: Emaimelei Restaurant & Kumangai Bakery. The food there was good, much like Carp. Left: Staglimites extend down into the water. Right: Inside one of the 4 large chambers. After another early AM breakfast buffet at the resort, it was back to the dive boat for a day of sightseeing at Peleliu. 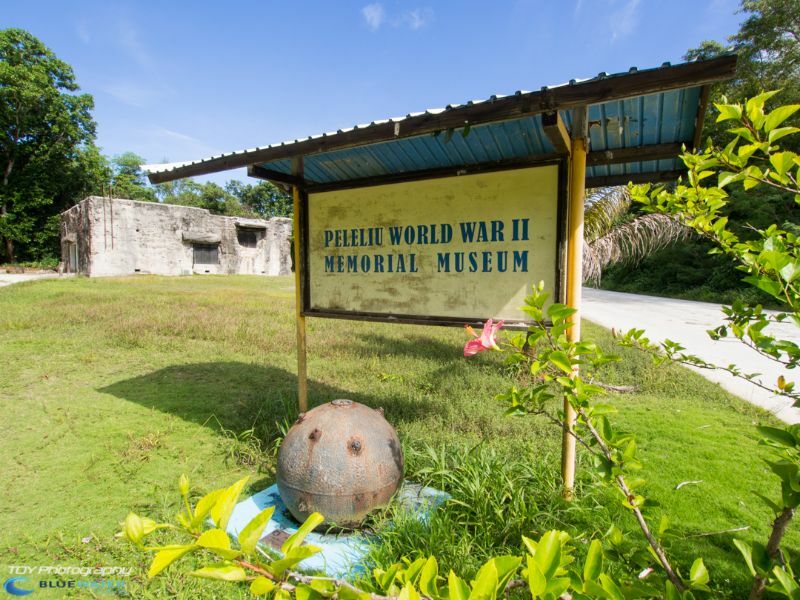 Peleliu is an island made infamous due to a great battle fought there between the Japanese and Americans during World War II. 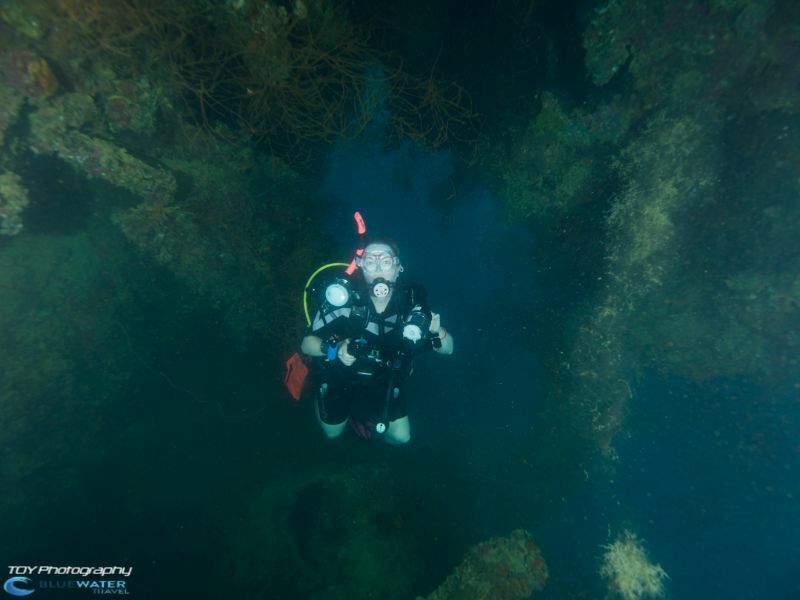 Our first dive was at Peleliu Wall. Although Peleliu is renowned for strong currents, those currents were strangely absent which gave us a chance to explore the wall. 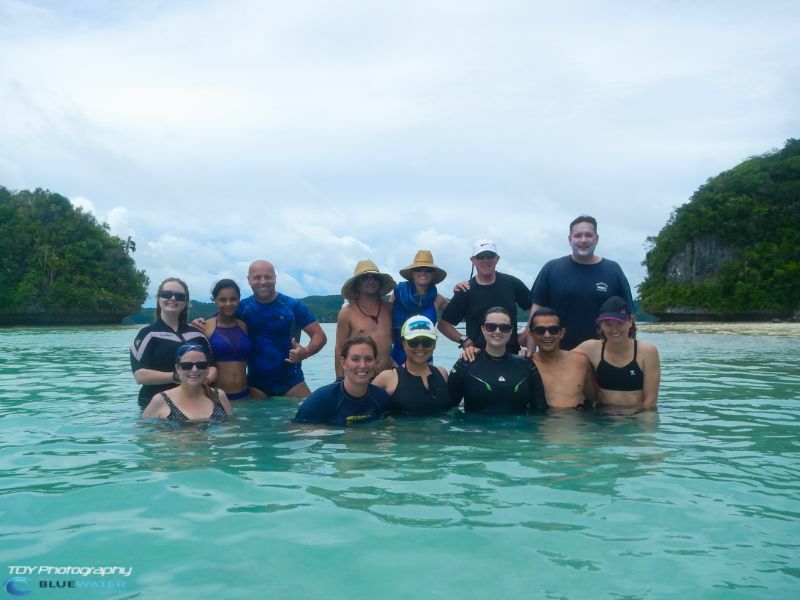 We sighted: healthy soft corals, sharks, turtles, bumphead parrotfish, and the usual Palau suspects. At about 11 am we took a surface interval at a park on Peleliu, and as the boat motored to our second dive site, bottlenose dolphins accompanied our boat—sporadically jumping out of the surf. 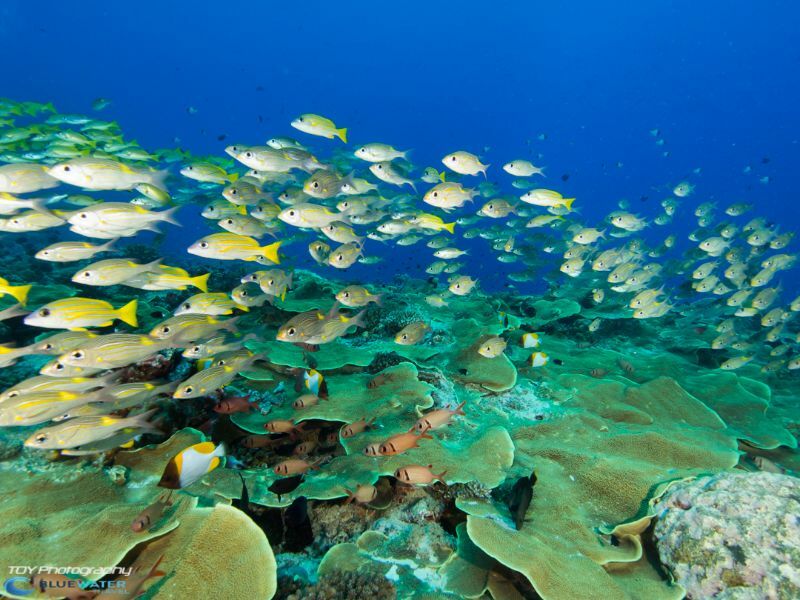 After descending at Peleliu Cut, we swam around the healthy soft coral reef and saw a school of jacks. 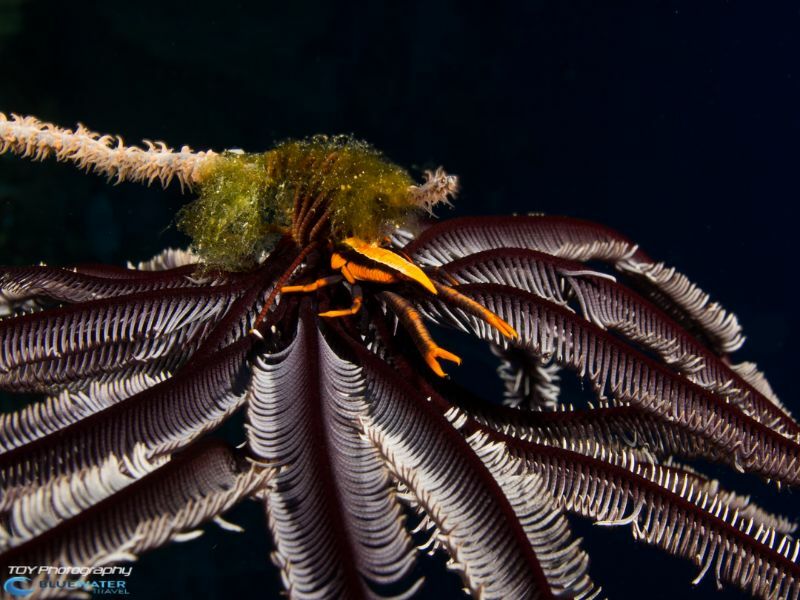 The lack of current allowed us to swim down and explore the walls arounds Peleliu Island and even shoot some macro. 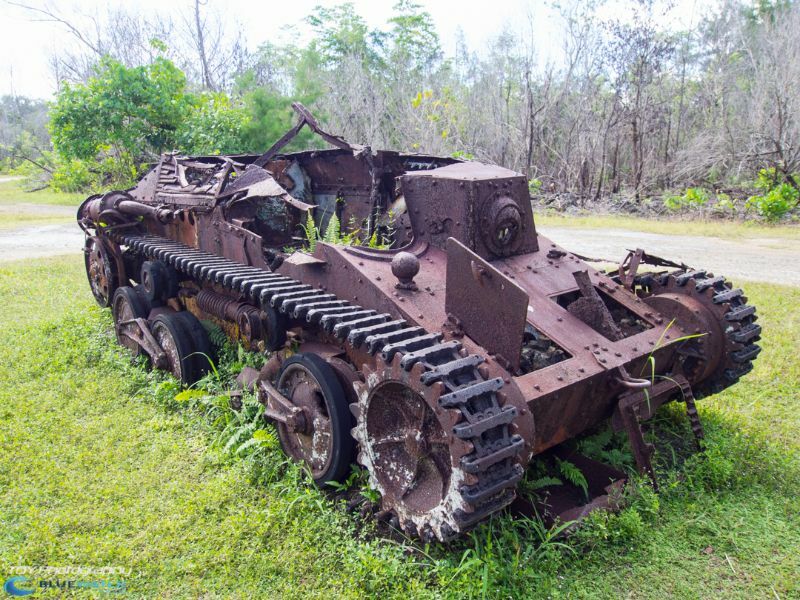 The highlight of the day was a World War II history tour of the island of Peleliu. Our enthusiastic guide named, Well, was from the Philippines. Starting in September, 1944, American and Japanese forces fought the Battle of Peleliu. This resulted in the highest casualty rate of any amphibious assault in American military history. The operation was supposed to be over within 4 days, but raged on for two months. U.S. Marines of the First Marine Division, and later soldiers of the U.S. Army’s 81st Infantry Division, fought to capture an airfield on the small coral island of Peleliu so the Japanese couldn’t use it. The U.S. managed to capture the airfield from the Japanese, but when the extremely bloody battle was over, 9,800 U.S. soldiers were wounded or dead (1,800 killed in action and 8,000 wounded). Estimates of Japanese casualties vary, but conservatively, 10,900 Japanese soldiers died. 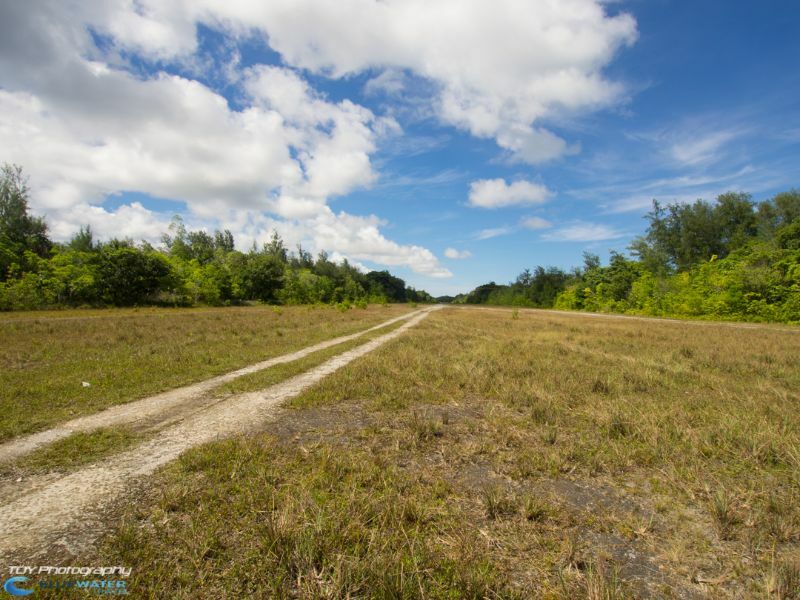 Left: The battle was over who gained control over the airstrip. Right: Americans first landed on Orange Beach. 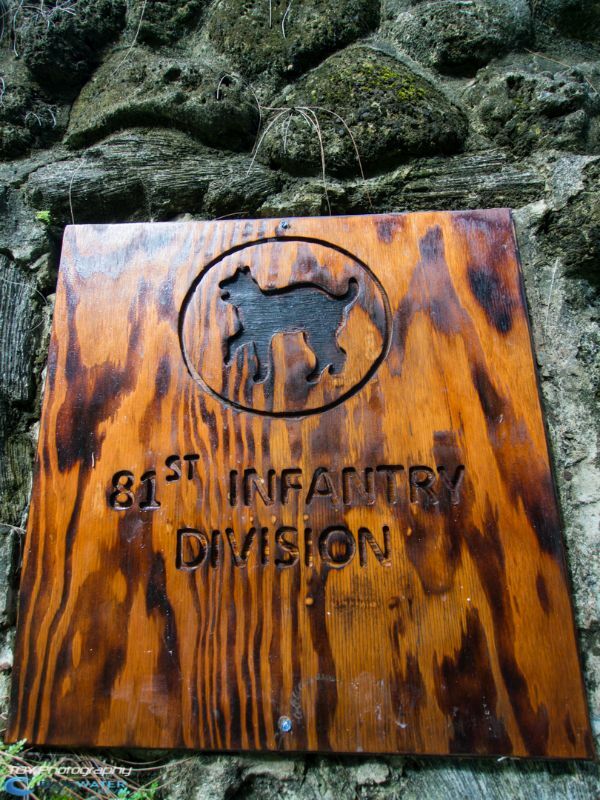 Left: Memorial plaque for the brave 81st Infantry Division. 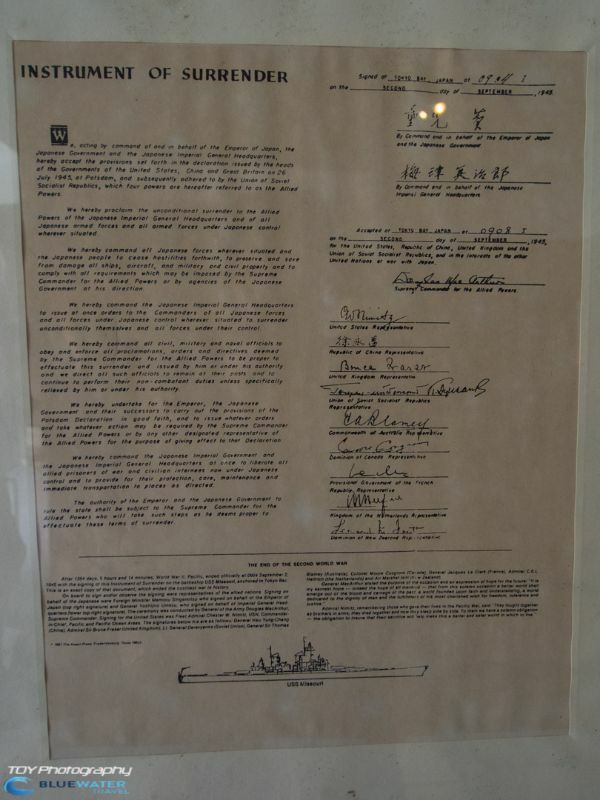 Right: The Instrument of Surrender in the Peleliu WWII Memorial Museum. 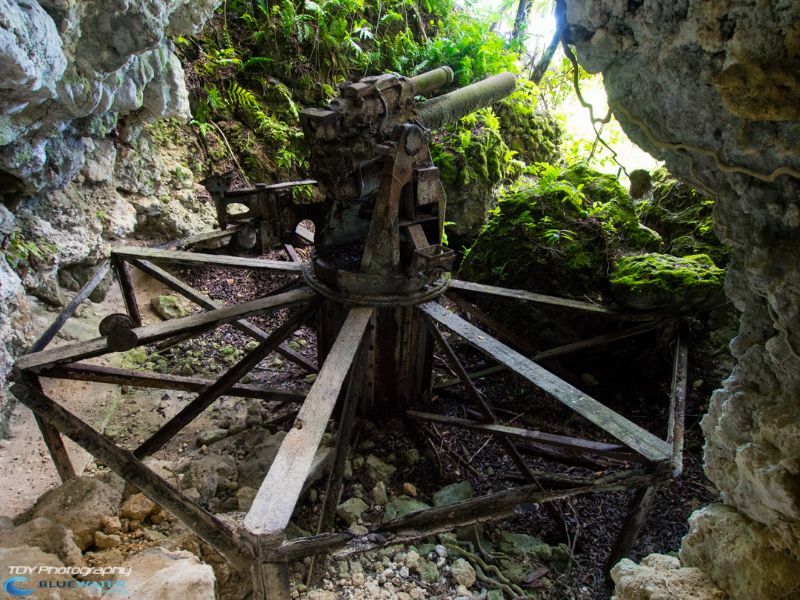 • The 1000 Man Cave - The Japanese dug the caves and hid from US soldiers during the wars. The U.S. closed 2 to 3 entrances (by bulldozer). We walked through the cave complex strewn with broken glass sake and beer bottles. Some Japanese men were found in the cave 2.5 years after the war had ended—they still thought the war was ongoing. Left: Peleliu WWII Memorial Museum. Right: A large Japanese gun erected in the hillside. 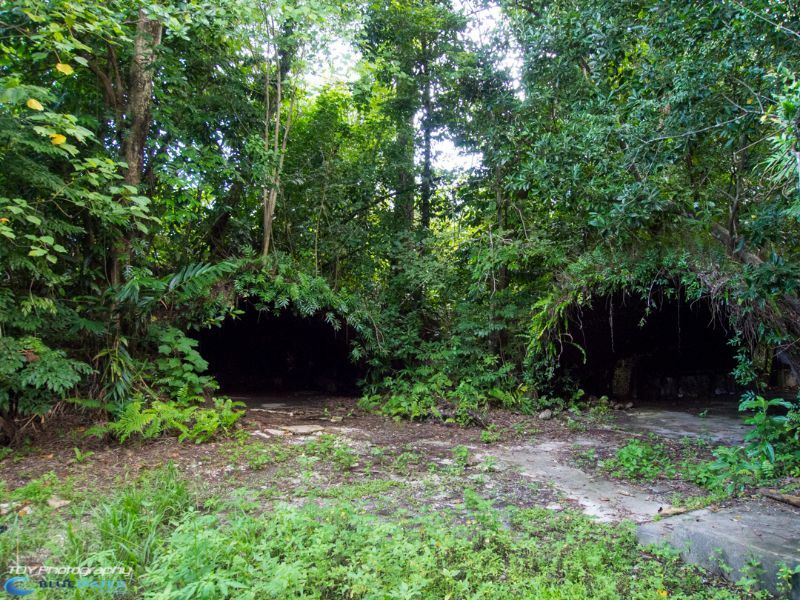 Ruins of the once grand Japanese HQ on Peleliu. We watched a beautiful Palauan sunset on our way back to the island of Palau. Dinner was at Carp again, but this time one of our fellow travelers ordered the bat soup, which came with a full bat in the soup—fur, wings, teeth and all. Left: An abandoned Japanese tank. Right: Photo opportunity atop Bloody Nose Ridge with 360 degree views of Peleliu. 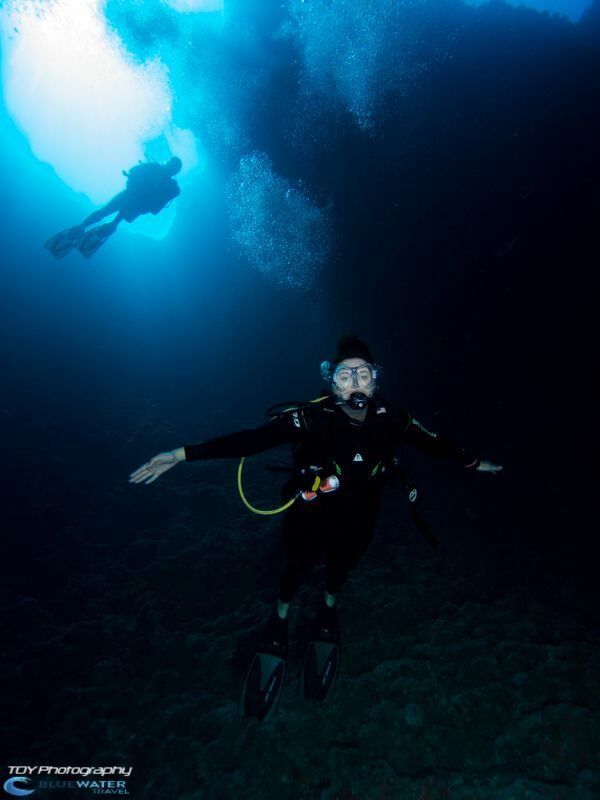 Our divemasters first referred to this site as “Blue Hole,” but we discovered there were multiple holes when we descended. 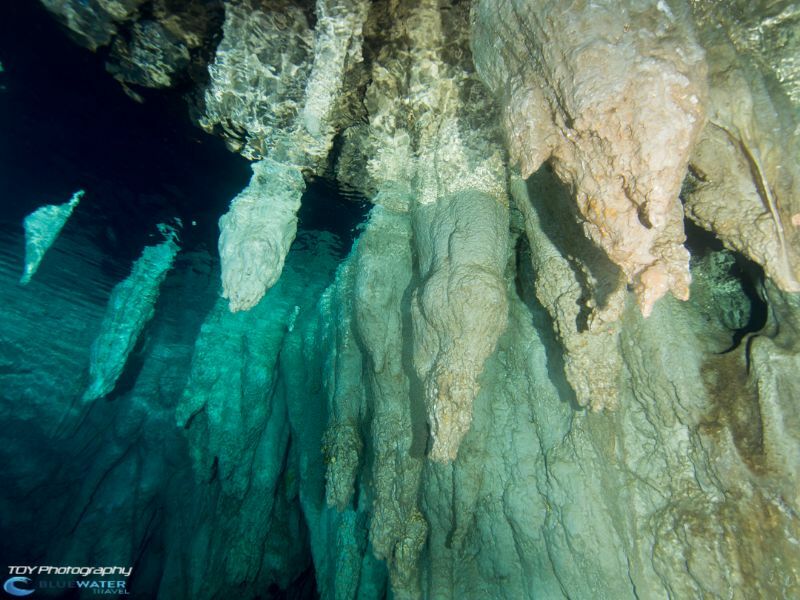 Because the openings in this giant sea cavern can be seen from the surface, Blue Holes was one of the first dive sites in Palau. We descended and swam through a shallow window opening in the rock at 30 feet then descended further to the bottom of the cavern. 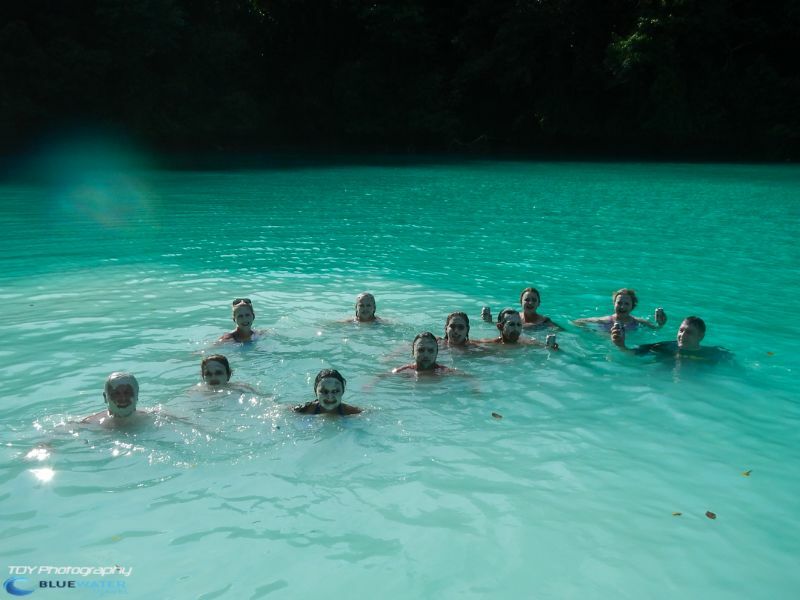 Looking upward, we saw four blue holes—openings to the sky of varying sizes, made a brilliant blue by Palau’s turquoise waters. 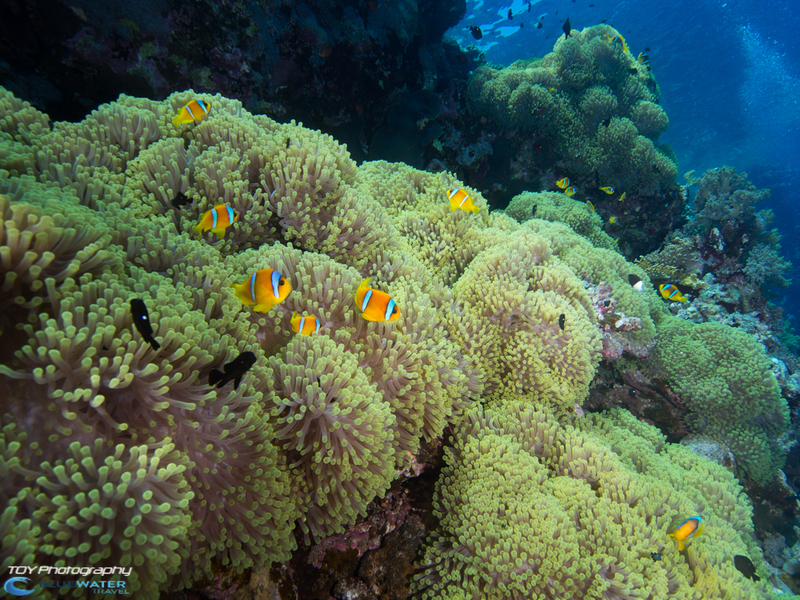 Once we exited the cavern we dove along a reef wall for the remainder of the dive and saw the usual Palauan suspects. Descending down into the Blue Holes. 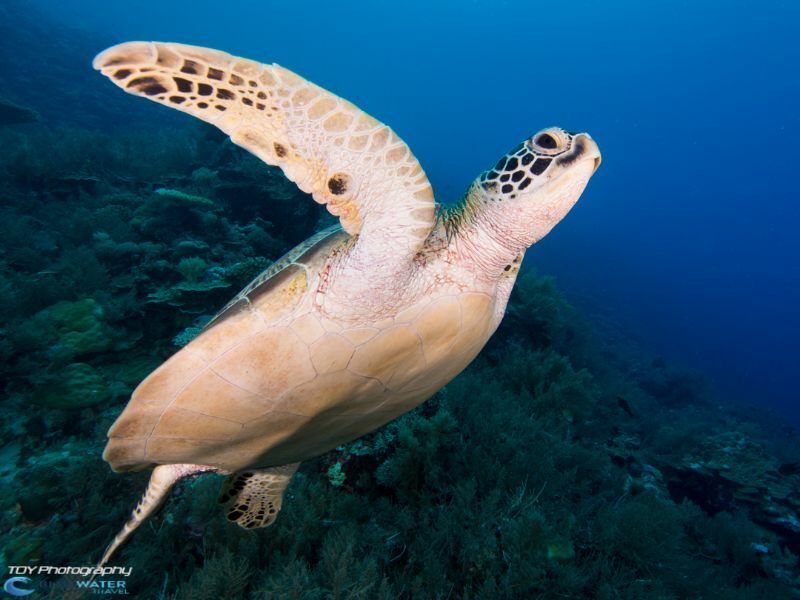 There had initially been some debate about diving Turtle Wall, but our divemasters informed us that Clarence Wall was a better place to see turtles. We were not disappointed. Diving along the reef wall, we had many close encounters with turtles. 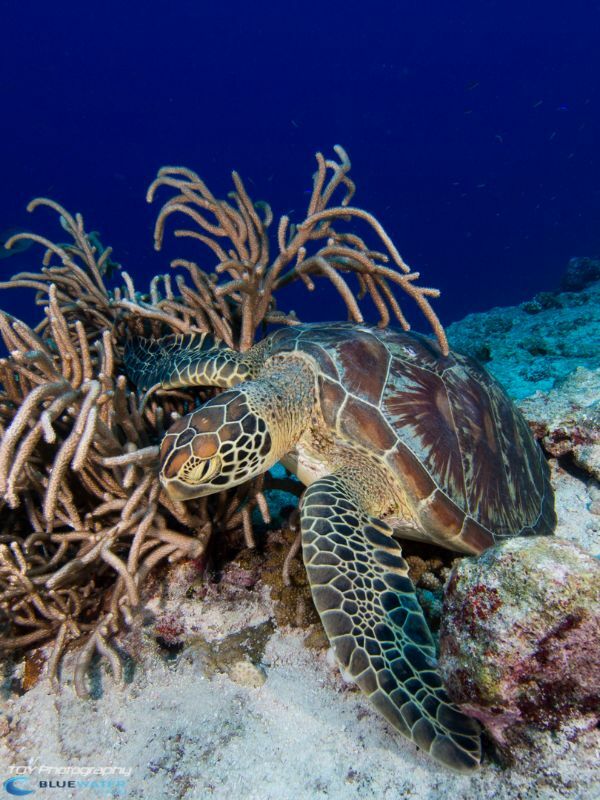 Unfortunately our scuba bubbles woke one turtle from his nap, but we were treated to a beautiful display as he gracefully pushed himself off the reef and swam right toward a few of the divers in our group. Another photogenic turtle chilled out on the seafloor while our underwater photographers snapped about 20-30 photos of him. 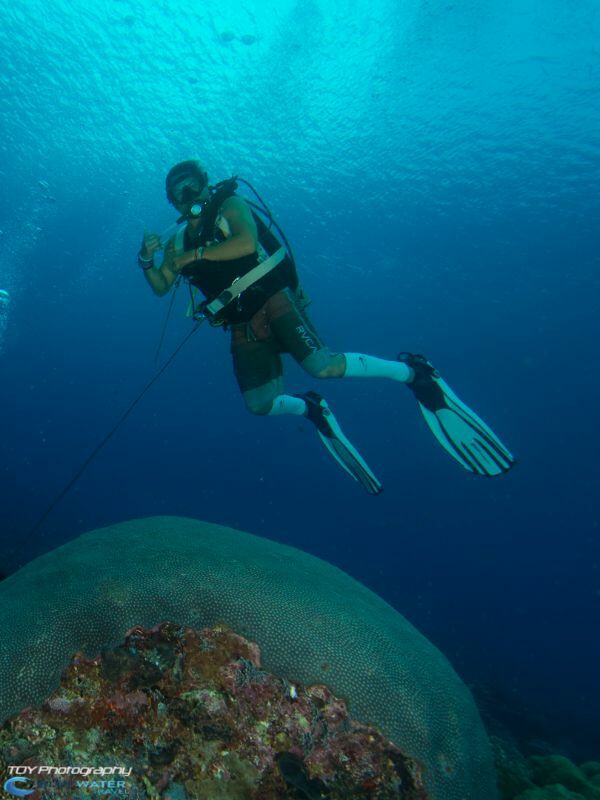 He even allowed divers to photo bomb his underwater photo shoot. Turtles galore at Clarence Wall. “Seaplane, seaplane, seaplane!” some of us chanted as we backrolled off the boat and into the ocean for the last dive of the day. 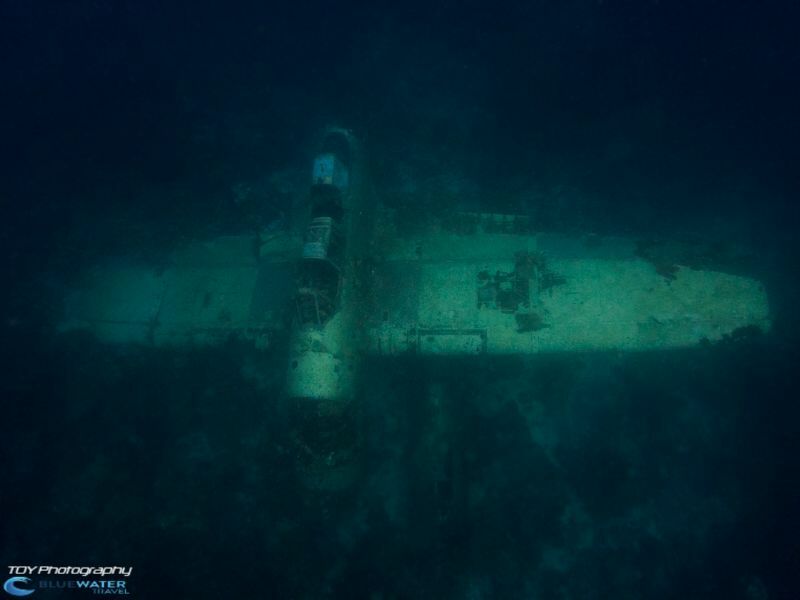 30 feet below the surface, lay a nearly completely intact World War II Japanese floatplane that crashed after the engine stopped during takeoff or landing. Many artifacts abound at the wreck site, including a radio, ammunition, and a small bomb. 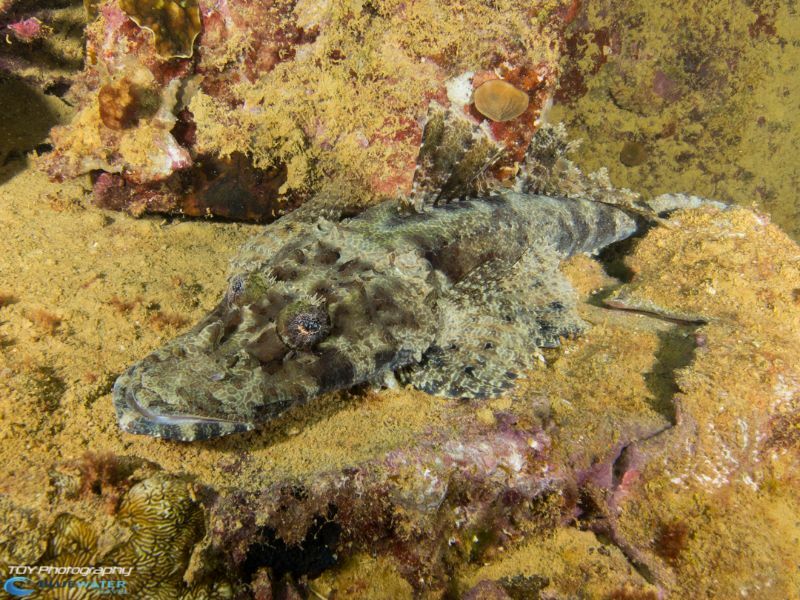 We also had a few sightings of a juvenile batfish and a nudi. For dinner that night, our group met our dive masters, Win & Malsol, at the only Indian restaurant on Palau. There was a delicious family set meal and a variety of tasty alcoholic concoctions. 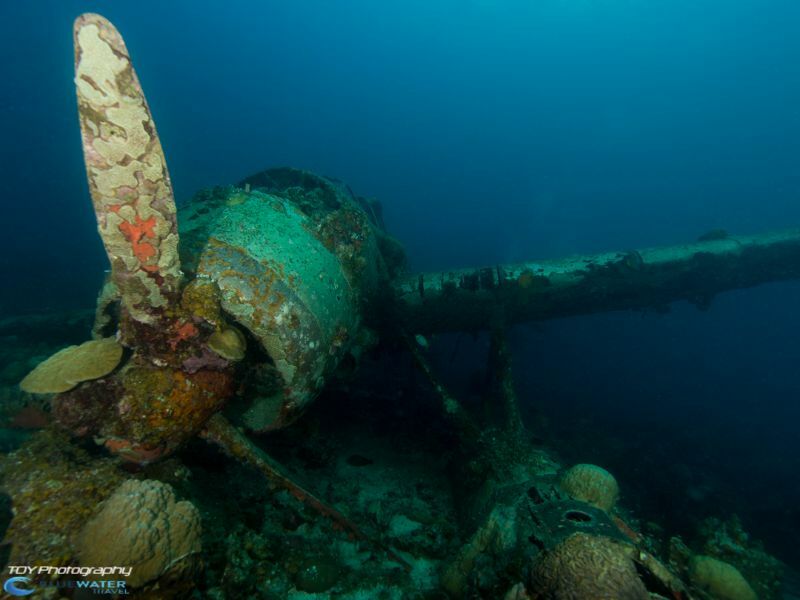 This World War II wreck was discovered in 1990, and hasn’t yet been salvaged so it affords a plethora of historic artifacts. 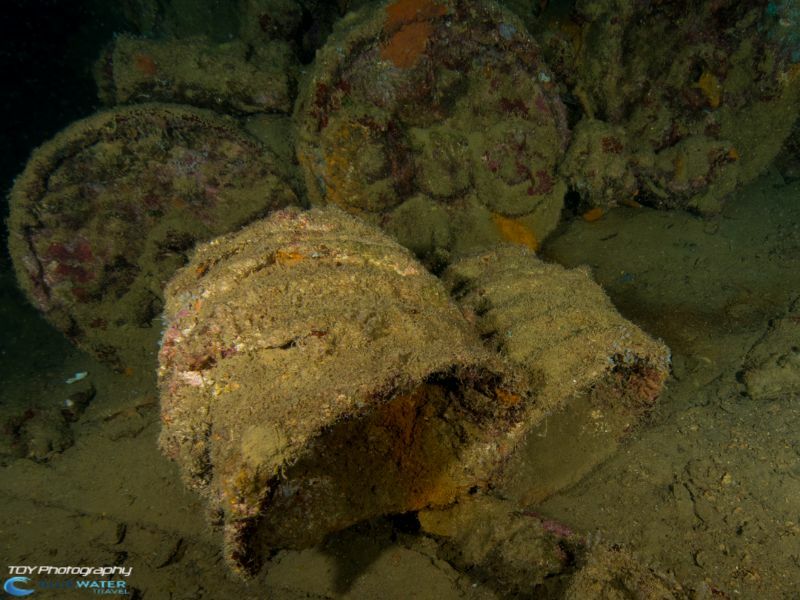 The dive site is simply called “Helmet Wreck” because stacks of helmets are lying on the deck and the original name of the ship is still unknown. 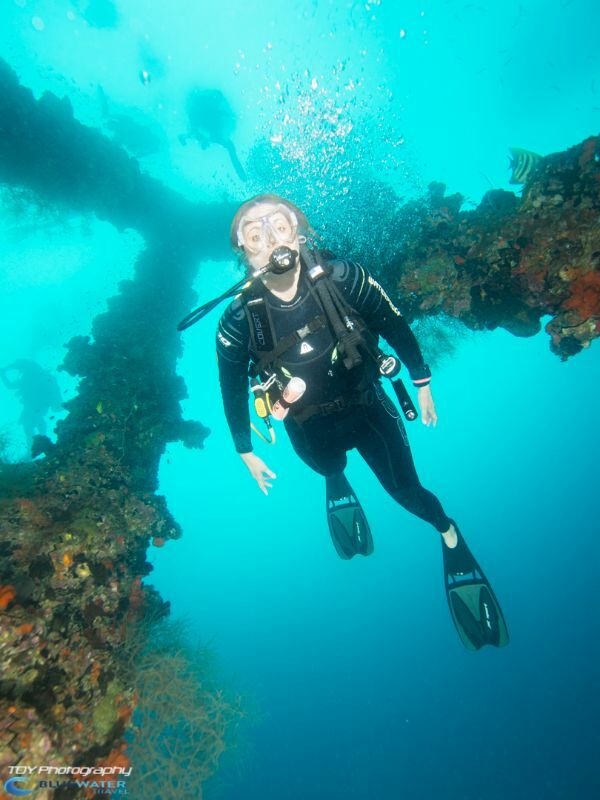 Helmet Wreck is one of the few wrecks where the explosion that caused the vessel’s demise originated from the inside. The ship was carrying depth chargers, one of which exploded—blowing a hole in the ship’s hull and spilling depth chargers all along the sea floor as the ship sank. 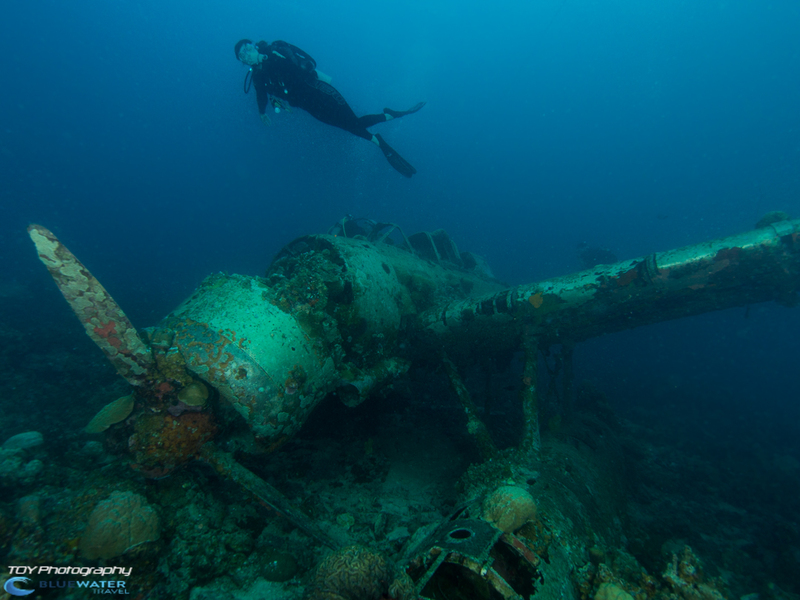 Diving this historic and un-salvaged wreck was an unforgettable experience. 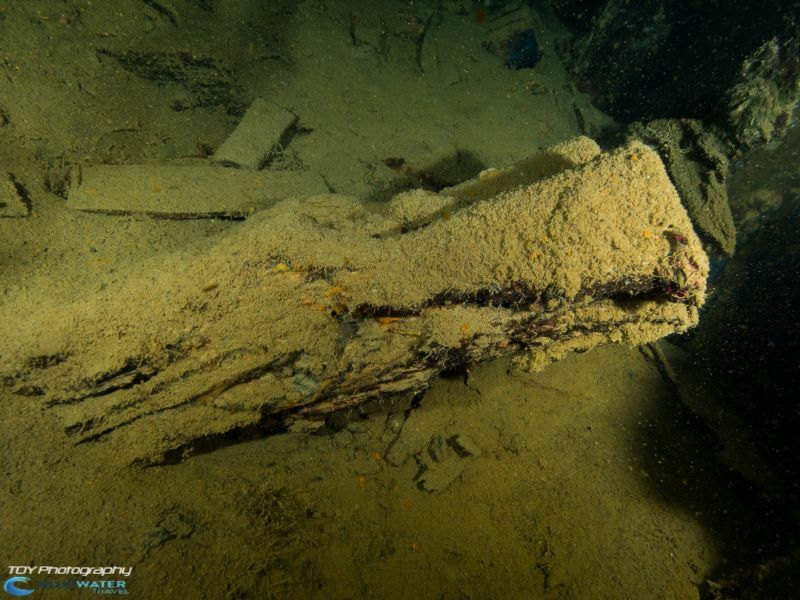 We glimpsed various artifacts covered in decades of underwater marine growth, such as riffles, sake bottles, gas masks, stacks of helmets, electrical wires, electronic equipment, ceramic jars, and even the infamous depth chargers. There was also some wildlife on display: a crocodile fish and a scorpion fish. Left: The helmets that gave the wreck its name. 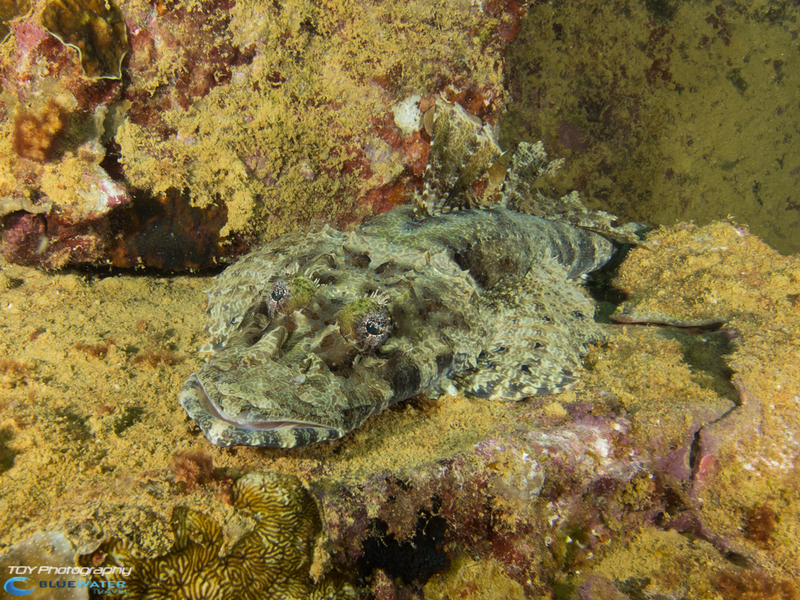 Right: Resident crocodilefish on the Helmet wreck. 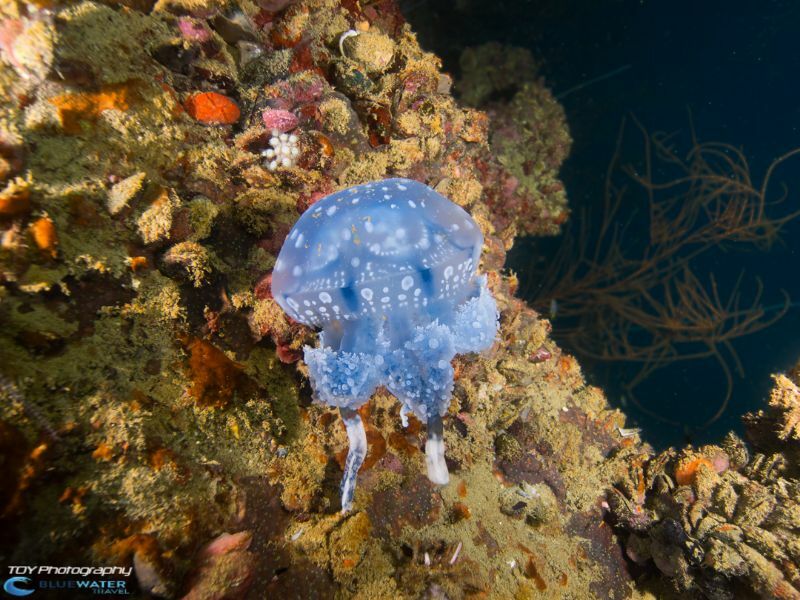 Our second Blue Corner dive was completely different from our first. We descended through strong current that quickly dissipated underwater. We approached the corner from a different direction, but could not superman it as before because there was virtually no current. 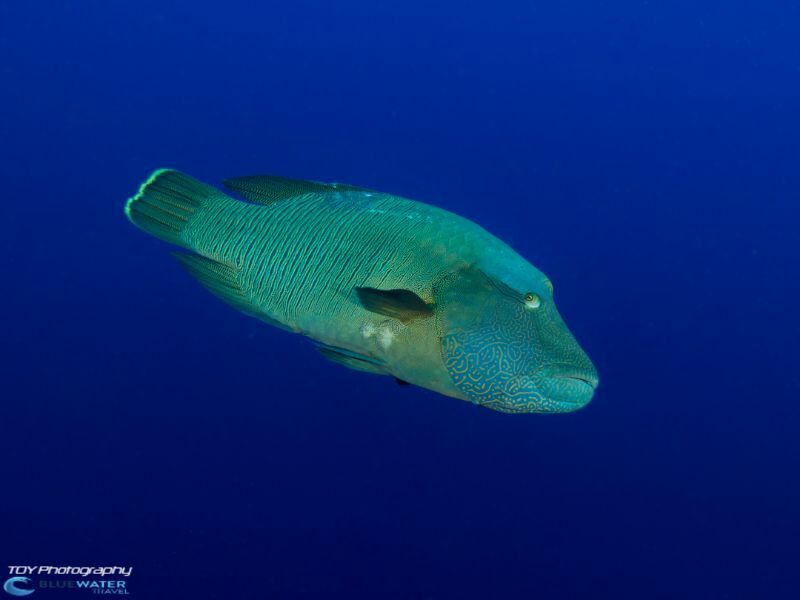 However, we still managed to see a few sharks, two spotted eagle rays, some big Napoleon wrasse, and yellow snappers. 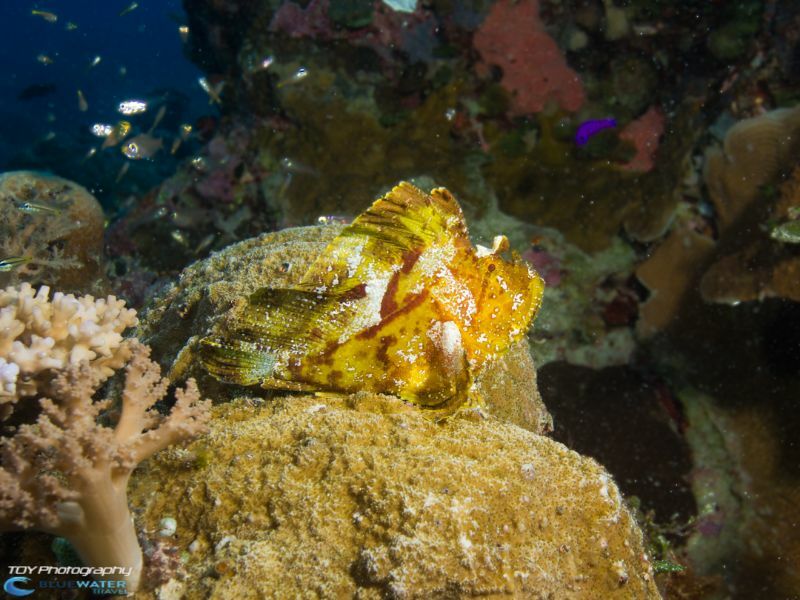 On our last dive of the trip, we sighted yellow snappers, big schools of pyramid butterfly fish, a couple of turtles, and beautiful soft coral. It was a pleasant, relaxed dive and everyone clocked 60 minutes or more underwater. At the end of the dives, the boat trolled through maze-like islands and stopped at Milky Way, where we bathed in the famous mud. 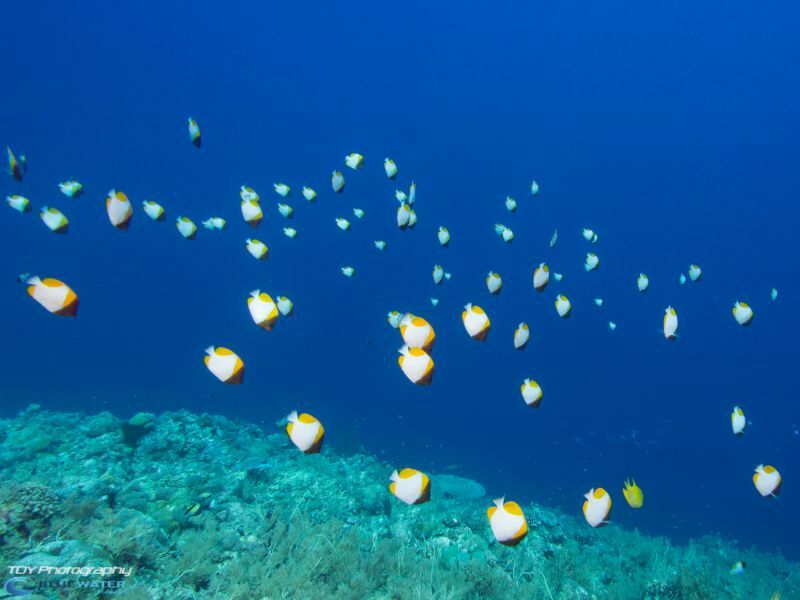 Large schools of pyramid butterflyfish (left) and snappers (right). 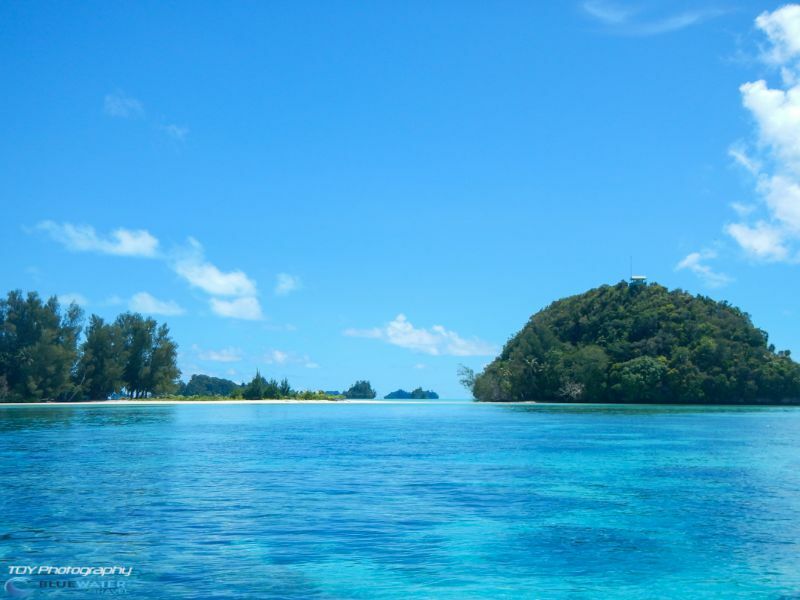 Left: Motoring through the beautiful rock islands of Palau. Right: Everyone getting a facial with the famous white mud at Milky Way. 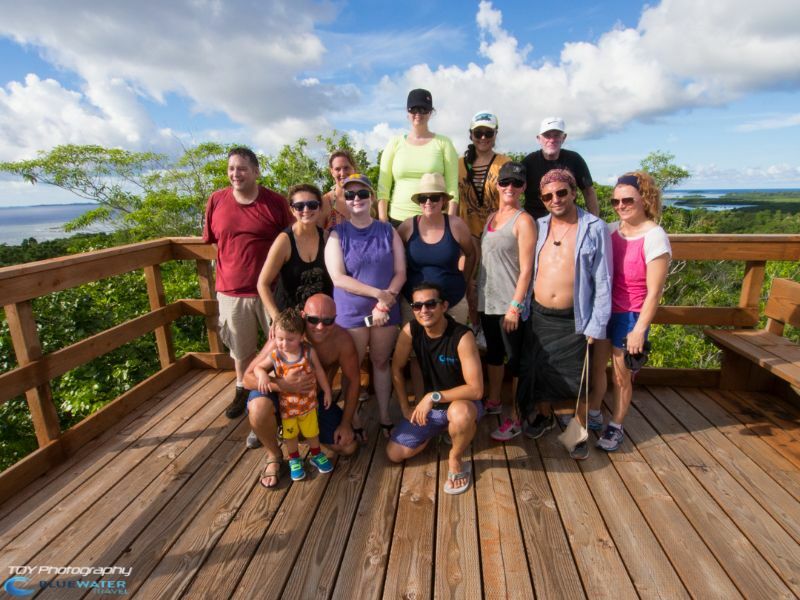 On our last day, we packed and checked out of the resort and took taxis to downtown, where we scurried from gift shop to gift shop in the hot Palauan sun and ate lunch at a local Chinese restaurant. Fish ‘n Fins brought shuttles to transfer us back to the airport, where we boarded our first flight back to Los Angeles. 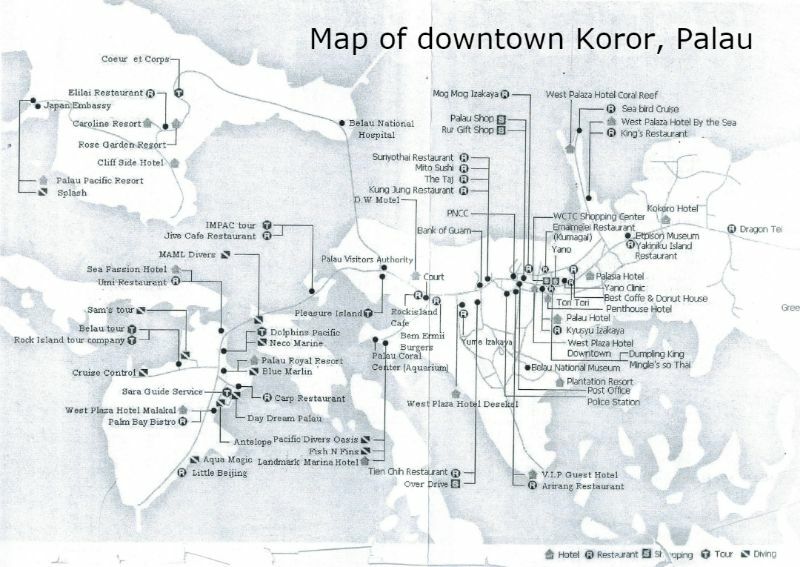 Map of downtown Koror, Palau provided by Palau Royal Resort. All-in-all it was an unforgettable trip filled with fun, friendly times and momentous memories. Bluewater Travel can book you on a resort or liveaboard in the Palau for the same cost or less than booking any other way. 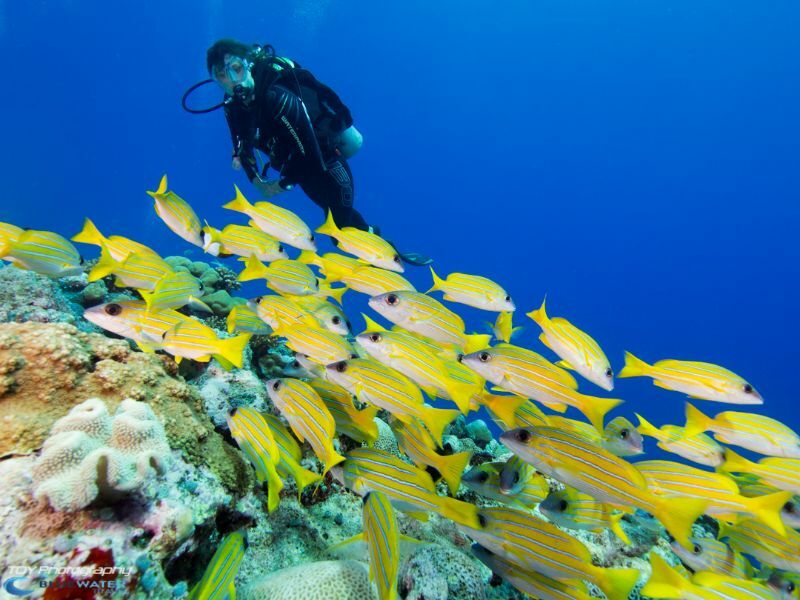 We know the diving, accommodation and when to go better than anyone else!